The Ho Chi Minh Road is fast becoming famous as one of the most scenic routes for a motorbike road trip in Asia. Although it will eventually stretch from the southern-most tip of the country to its northern border with China, to date (2016) the Ho Chi Minh Road has been fully paved from Saigon in the south to Hanoi in the north: nearly 2,000km of unbroken road, cutting through some of the most spectacular landscape in Vietnam. The best scenery can be found along the central section, where a landscape of endless limestone mountains, covered in a thick fleece of tropical rainforest and dissected by clear blue rivers, stretches to the horizon: if you only ride one part of the Ho Chi Minh Road, make sure it’s this one. Below is my full guide to the Ho Chi Minh Road, including route information, places to stay and eat, and things to see and do along the way. The Ho Chi Minh Road (not to be confused with the Ho Chi Minh Trail, most of which is in Laos) runs along the mountainous spine of Vietnam, known as the Trường Sơn Range. For much of its length, the road is a quiet, well-made, easily accessible, two-lane highway which sees very little traffic compared to the other major north-south road, Highway 1. In this comprehensive guide I’ve written a description – including places to stay and eat, and things to see and do – of the entire Ho Chi Minh Road from south to north; starting from Saigon and ending in Hanoi. As this is a very long guide, I’ve divided it into 3 main parts: Southern, Central, and Northern. These are then subdivided into 8 smaller sections. Note that each section does not necessarily correspond to one day on the road. Although following the Ho Chi Minh Road all the way from south to north is a great road trip in itself, most people choose to mix it up with some coastal routes. 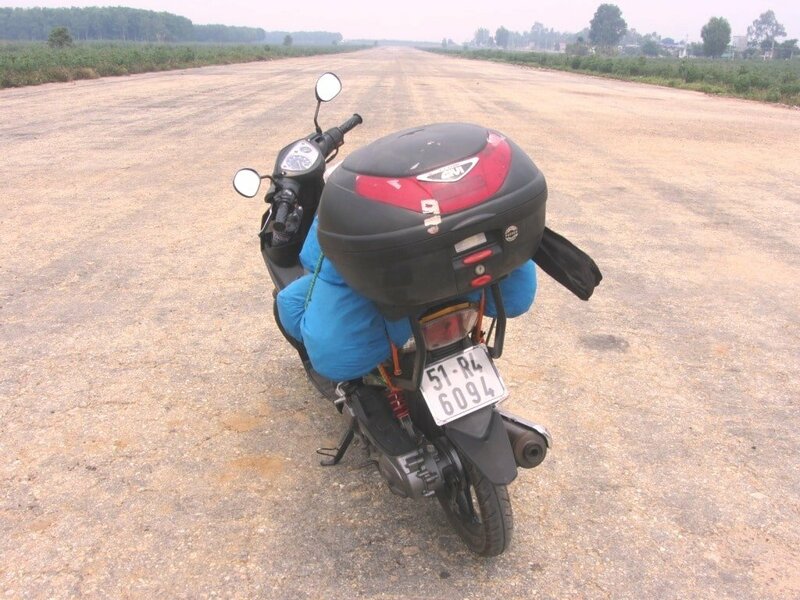 If you only want to see the very best that the Ho Chi Minh Road has to offer, start from Kon Tum and head north all the way to Pho Chau (sections 3 to 6): this is one of the best rides in Vietnam, including the jaw-dropping Western Ho Chi Minh Road (section 5). There are now dozens of east-west roads connecting the Ho Chi Minh Road with the coast: for ideas about how to include the Ho Chi Minh Road as part of a more varied south to north road trip, take a look at my Five Suggested Routes from Saigon to Hanoi. As the Ho Chi Minh Road runs the length of the country and is so mountainous, it’s difficult to determine the best time of year to ride it. However, weather conditions from March to September are generally the most favourable. (Refer to my Weather Guide for more information about seasons and climate in Vietnam). The total distance is 1,880km and average duration is around 2 weeks. Getting to the Ho Chi Minh Road from downtown Saigon requires a brief but nasty stretch on Highway 13, leading north over the clogged Binh Trieu Bridge and out into the smog and Mad Max-ian scrum of Saigon’s industrial belt. But, just as the appalling industrial apocalypse becomes too much to bear, new roads cut north, towards Binh Duong New City. An eerie but pleasing spectacle, these smooth boulevards run through the centre of a new urban development that’s been laid out and constructed but has yet to be filled with (too many) people. It’s a pleasant and smooth ride through this ghost city and out the other side into the cold, damp rubber plantations. 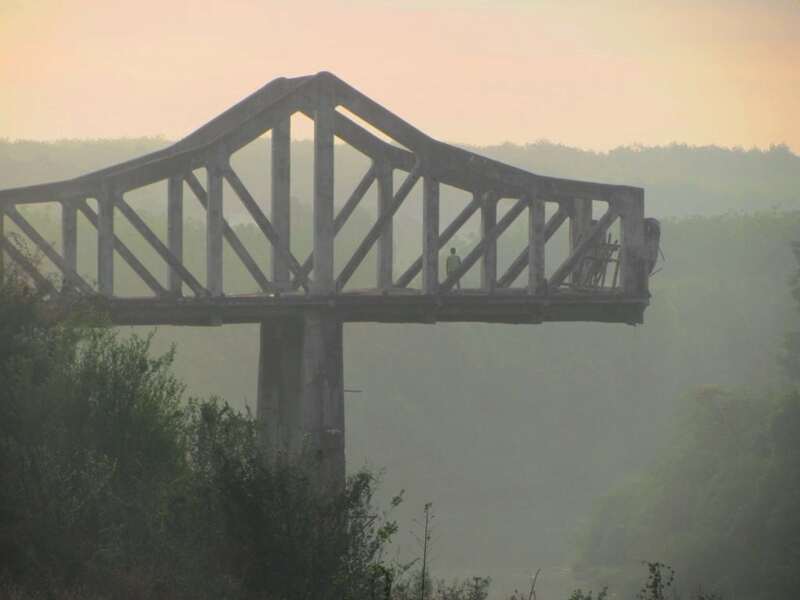 A good highway (DT741) whisks you up to Dong Xoai – don’t miss the haunting sight of an old concrete bridge that’s split in half over a jungle-clad riverbed to the east of the road. For a town whose name – as far as I can tell – means ‘Field of Mangoes’, Dong Xoai is a surprisingly big, busy, bustling and commercial city, with everything you’d expect to find in such a place: restaurants, hotels, ATMs, cafes and, of course, dust. At just over 100km from Saigon, Thanh Sang Hotel (1068 Phu Rieng Do Street: 0651 3 879 559; rates from 200,000vnd a night) is fine for a night if you’re running out of daylight. Dong Xoai is where you first hit the Ho Chi Minh Road. It’s in great shape here and, almost immediately, one begins to get a sense of the surprising scale of Vietnam’s landmass. 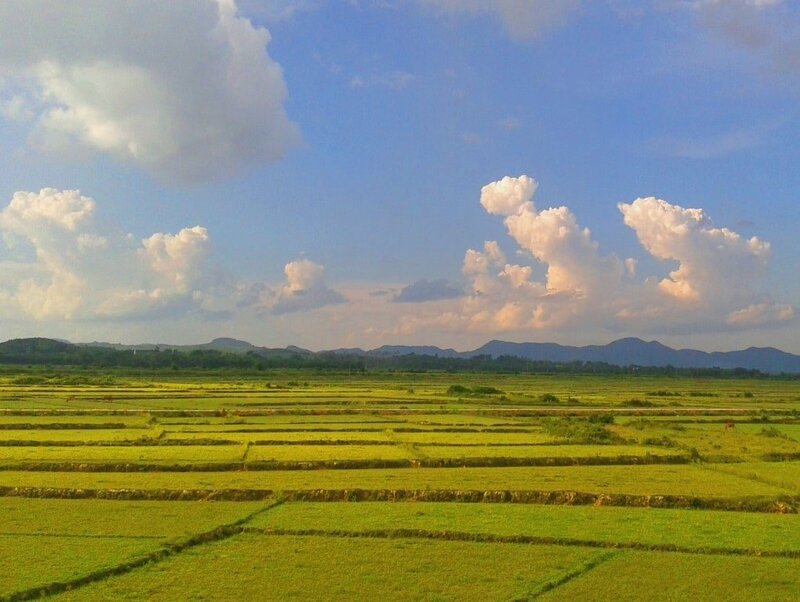 The big distances and horizons on this vast agricultural plateau – which essentially continues all the way north beyond Kon Tum and into Laos – and the sense of space and light, are on a grander scale than one would expect in Vietnam. 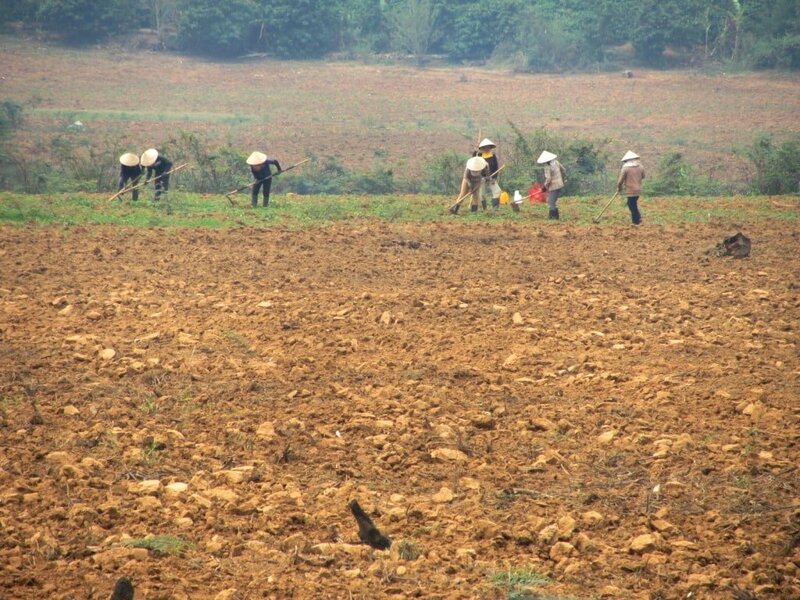 The smell of the rich, red earth – the soil that makes this region the agricultural bosom of Vietnam – rises with the morning mist. Everything grows here, and it grows bigger and greener than anywhere else. The Ho Chi Minh Road – with its characteristic yellow centre-markings – glides over gentle ridges cloaked in plantations: rubber, cashew, passion fruit, jackfruit, pepper. Houses, people, vehicles, road surfaces, hillsides are all covered in a layer of red dust. Gia Nghia is a large town alternately carved out of, and perched on top of, the red-soiled hillsides. 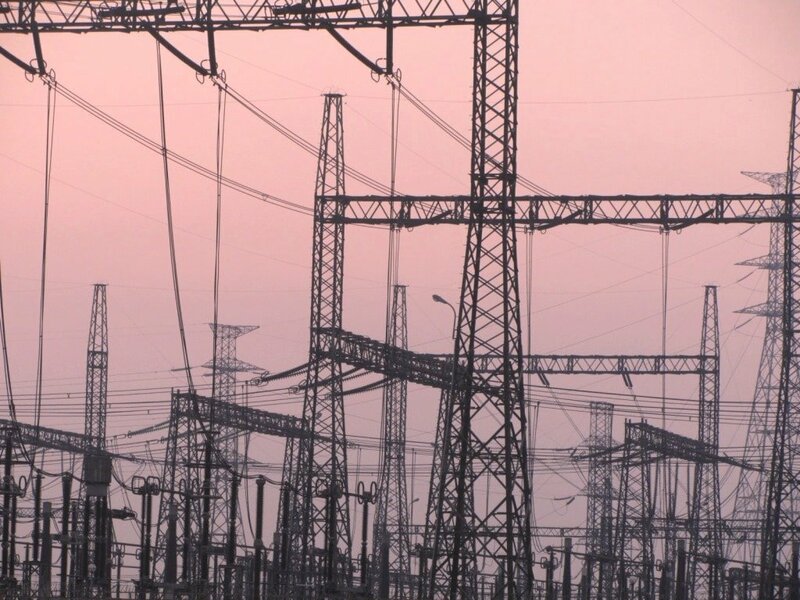 It’s a town of red-tiled rooftops and revolutionary monuments, of steep streets and grand, empty boulevards, of official government buildings and, thanks to a mammoth hydroelectric project, water. Pleasant in the sunshine, grim in the rain, Gia Nghia is a fascinating off-the-beaten-path place to spend a night. The old town sprawls over the first hillock as you enter town from the highway, while the new town climbs up the hill behind it. The latter has an astonishing amount of government edifices and some large, decent hotels. But the old town, especially around the crumbling market, is where all the action and life is. 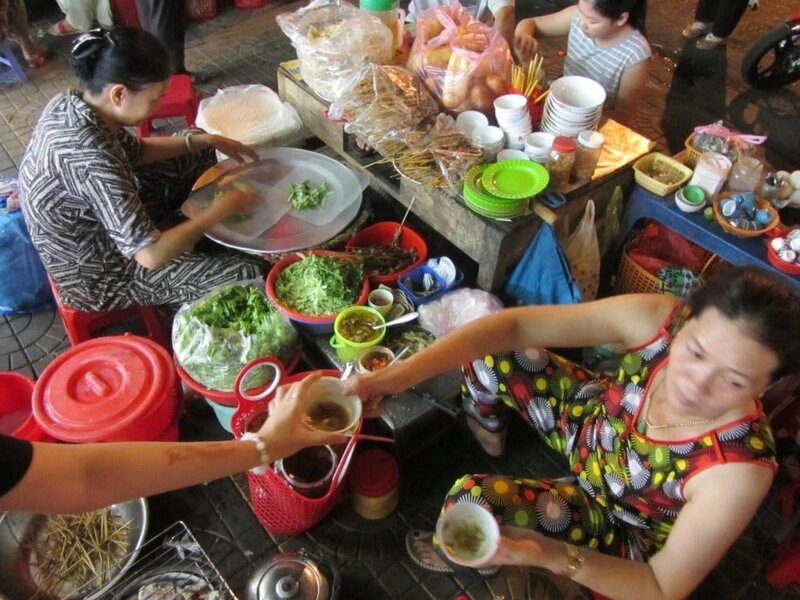 There’s plenty of street food treats to delve into around the market and you can stay near it too, at Nhà Nghỉ Quang Phuc (176 Ton Duc Thang Street: 0168 909 3420; rates from 150,000vnd a night), or head to the new town for larger (government-scale) lodgings, such as Dak Nong Lodge Resort or Nha Khach Dak Nong (25 Le Lai Street: 0501 3 500 077; rates from $20 a night). From Gia Nghia to Buon Ma Thuot, the Ho Chi Minh Road cuts through a bedraggled landscape: a patchwork of small-hold farms and plantations; a previously forested region that now appears to be suffering from baldness. When the road straddles the Cambodian border at Dak Mil, echoes of the American War ring out: this desolate region was heavily bombed by US aircraft to prevent supplies reaching soldiers in the south, and it’s not difficult to imagine it, even now, as dozens of plumes of smoke smudge the horizon, rising from fires in the forest, clearing the way for cultivation. Buon Ma Thuot, coffee capital of Vietnam, is not a particularly nice place, but nor is it anything like as bad as many guidebooks suggest. It’s big, hot, and busy. But the streets around the ‘old quarter’, near the market, are shaded by low trees and full of lively commerce, interesting street food, local banter, and throbbing cafes. If this appeals to you, as it does me, stay at Nguyen Nhi Hotel (164 Ly Thuong Kiet Street: 0500 3859 868; rates from $10 a night) or opt for the large, neat, mid-range rooms at Saigon Ban Me Hotel. If you’d rather see some greenery from your window and be a little bit away from the action, try Damsan or Eden hotels on Nguyen Cong Tru Street. The latter is also a good street to try the area’s famous coffee: make sure to pick a local cafe on the south side of the street so as to get a view. Dining and drinking is also good on Nguyen Cong Tru, or there are lots of street food treats on Y Jut Street, including a night market that takes up most of the ‘old quarter’. 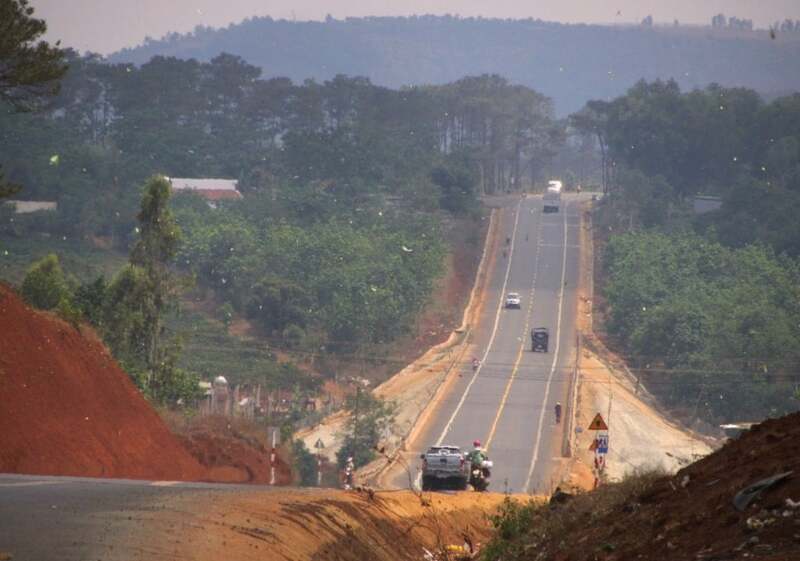 After negotiating through a glut of vehicles leaving Buon Ma Thuot, the Ho Chi Minh Road cuts northeast, as straight as a landing strip, over an agricultural plateau. 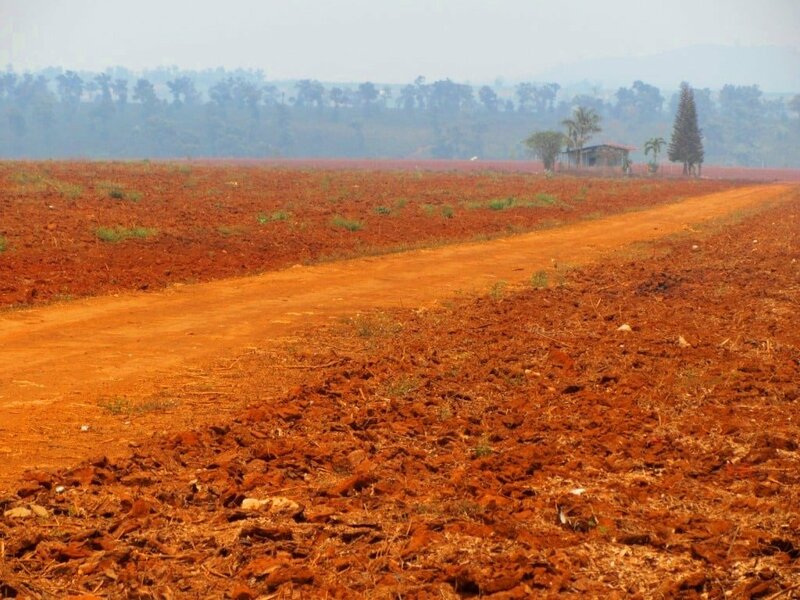 The red soil – somehow deeper and earthier than previously – is a dusty plague of airborne particles, making the air thick and hazy, especially with the addition of smoke from burning fields and exhaust fumes from passing trucks. 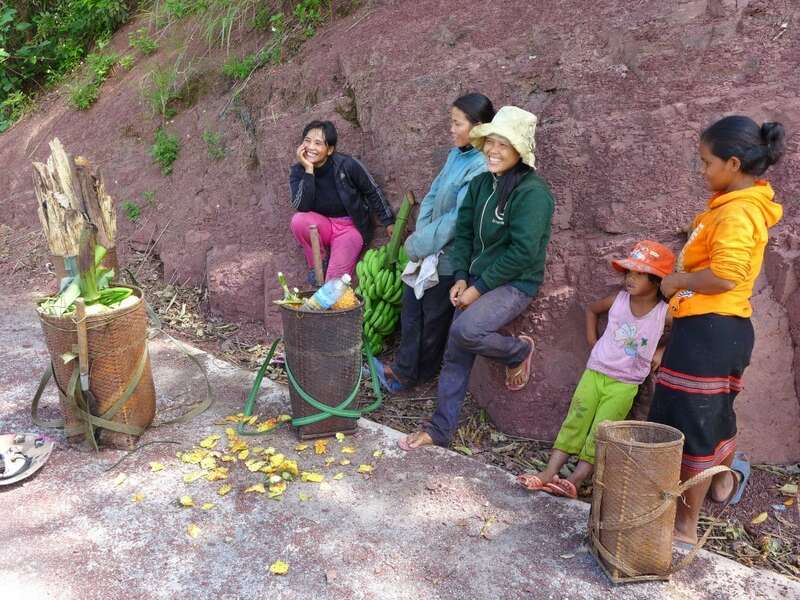 The red earth even appears to have changed the pigment of local people’s skin: much of the population on this plateau are ethnic minorities whose skin tone is darker and more leathery in appearance than lowland Vietnamese, as they spend much of their lives working outside on the land. Buon Ho is another dusty, busy little place with a few hotels and food stalls dotted about the high-street for anyone who needs a break from riding. 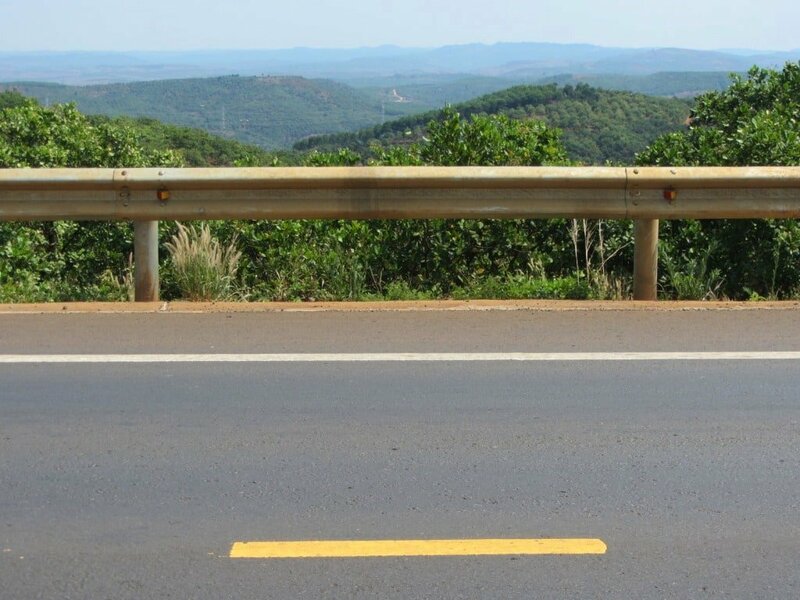 The Ho Chi Minh Road is in excellent condition all the way from Buon Ma Thuot to Pleiku. And this is a good thing, because it makes an otherwise uninspiring leg of the journey more enjoyable. Just the occasional cluster of pine trees and the vast scale of the plateau keep you engaged as the road sweeps through this desolate, bleak blanket of agricultural land. 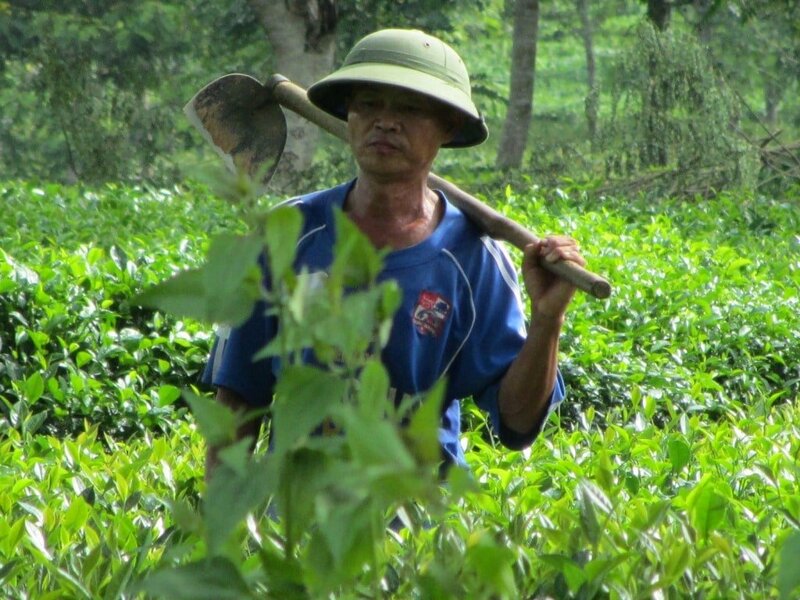 At times the land is covered in squat coffee bushes and spindly rubber trees, standing erect in neat ranks on the hillsides, like the formations of a medieval army on the battlefield, before the fighting begins. Indeed, a battle did take place in these hills, some 50 years ago, between American forces and the North Vietnamese Army. In 1965, in the Ia Drang Valley – a name which still has a chilling ring to it – to the west of the Ho Chi Minh Road, hundreds of US troops and thousands of Vietnamese were killed fighting under a deluge of bombs from B52s, in what was the first direct conflict between the two sides of what became known, in the West, as the ‘Vietnam War’, but what is known in Vietnam as the ‘American War’. Today, the Ia Drang Valley is an especially dry place: the earth has a crisp, burnt crust to it and the colours are washed out, even the distant peaks are beige and arid. Wooden plank homes – covered in red dust – dry peppercorns in their front yards, adding spice to the hot highland air. Pleiku emerges from the dusty highland plains, looking as if a bag of concrete has been dumped over a hillside and left to dry. As Kon Tum is only another hours’ ride north of here, there’s not much incentive to stay in Pleiku. 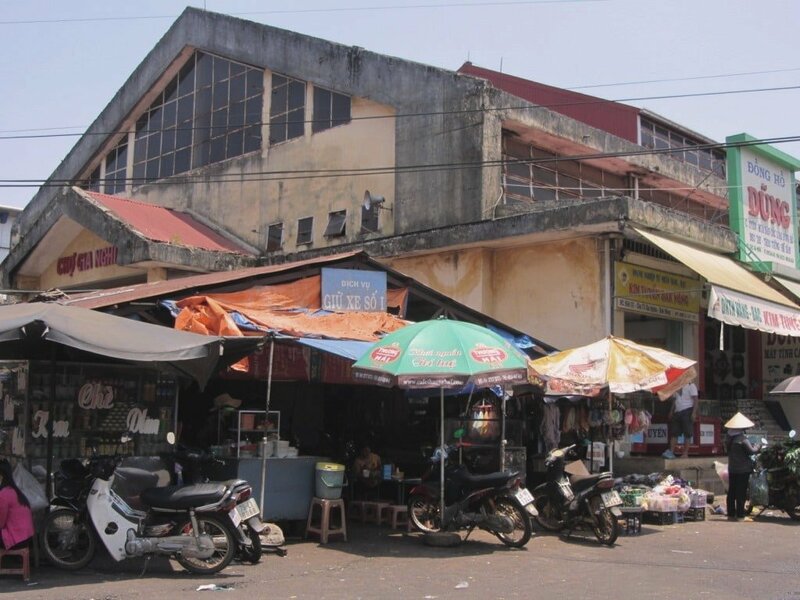 But, although its main streets are pretty charmless, venture down some of the backstreets and you might find you come to like the rough, ready, ungentrified character of Pleiku. There’s a great, dilapidated central market with a couple of hotels nearby (try the aging Se San Hotel or Tre San Plaza Hotel at 18 Le Lai Street). There are many more accommodation options in all ranges by the main intersection and along the highway, including lots of nhà nghỉ (local guesthouses) and the upmarket HAGL Hotel. In fact, even the city’s much-derided, Soviet-era public buildings and government edifices are, to my eyes, becoming more interesting and appealing with each passing year: I am finding that, as these buildings become rarer with all the demolition and construction in Vietnam today, what I once considered eyesores are now becoming nostalgic architectural icons. Between Pleiku and Kon Tum, the Ho Chi Minh Road is arrow-straight and the scenery changes for the better. Rugged mountains grow up from the plains, where rivers provide enough water for rice cultivation. Kon Tum has a fabulous position: on the banks of the Dak Bla River with mountains behind. Peaceful during the day and pleasantly abuzz in the evenings, Kon Tum is a very characterful highland town: colonial buildings, riverside promenades, views of the surrounding countryside, good cafes, excellent accommodation options and delicious food are just some of its merits. Thinh Vuong Hotel (16 Nguyen Trai Street: 060 3914 729; rates from 200,000vnd a night) is a superb budget choice tucked down a backstreet, walking distance from the riverfront. Indochine Hotel offers good mid-range value with large river-view rooms. Nguyen Hue Street is a good place to dine: either at one of the many budget rice eateries or beer and food joints further up the street. After dinner, head to the river promenade for a walk and a coffee or beer at one of the cafes, and don’t miss the bamboo interior of Cafe Indochine, one of many new works by architect, Vo Trong Nghia, who is fast becoming Vietnam’s answer to Norman Foster. For street treats head to the market and settle down to a hearty bowl of soup and finish the night off with a sweet glass of chè. Head northwest on Kon Tum’s main street (Phan Dinh Phung) towards Dak To. The first hour is along a dead straight ribbon of asphalt that bisects the Kon Tum Plateau, which is covered in plantations of towering rubber trees and coffee bushes. Silhouettes of mountains loom on the horizon and there’s a fruity, flowery smell in the air as it gets cooler and thinner. Just out of Dak Ha is the first glimpse of real, unplanted forest to the west. Dak To is a forgettable town, but there are some hotels on the high-street if you need them. The surrounding area was the scene of some of the fiercest battles of the American War. The countryside still bears the scars of all the bombs and defoliants that were dropped on the hills and forests here during the autumn of 1967. A few kilometres after passing Dak To, look out for an old US landing strip just to the left (south) of the road. The long stretch of tarmac is still visible through the fields of cassava that have grown up around it. Today the landing strip is used by farmers to dry their crops on, and you can walk or ride along it on your bike. At Ngoc Hoi there’s a glut of hotels on the main street, although staying here is not an exciting prospect. 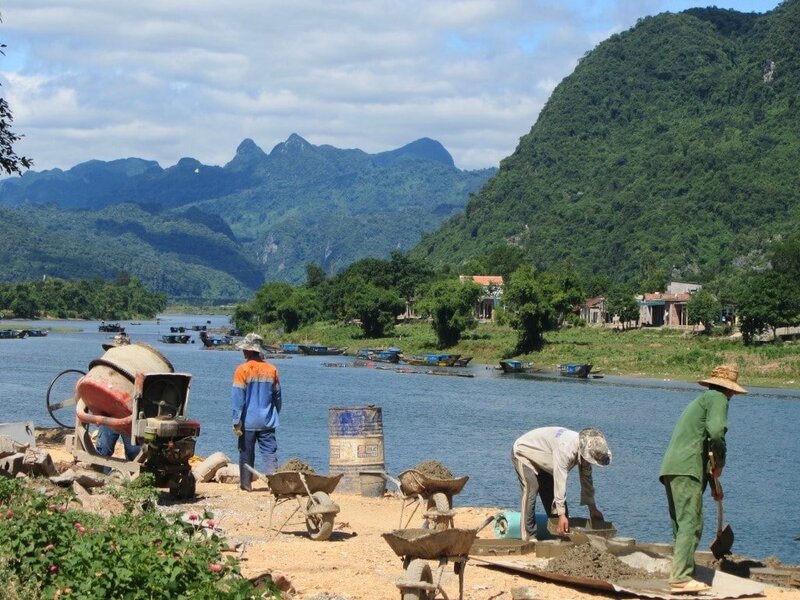 The town is being groomed as an economic gateway between Vietnam, Laos and Cambodia, thanks to the opening of a triple border gate some 15km to the west. Note: At Dak To the Ho Chi Minh Road makes a sharp turn to the left (due west) that’s quite easy to miss if you’re not careful. 20km later, there’s another sharp turn to the right (due north) at Ngoc Hoi: if you take the wrong turn here you’ll quickly end up at either the Cambodian or Lao border! From Ngoc Hoi to Dak Glei the road follows the valley of the Dak Po Ko River, not far from the Laos border. 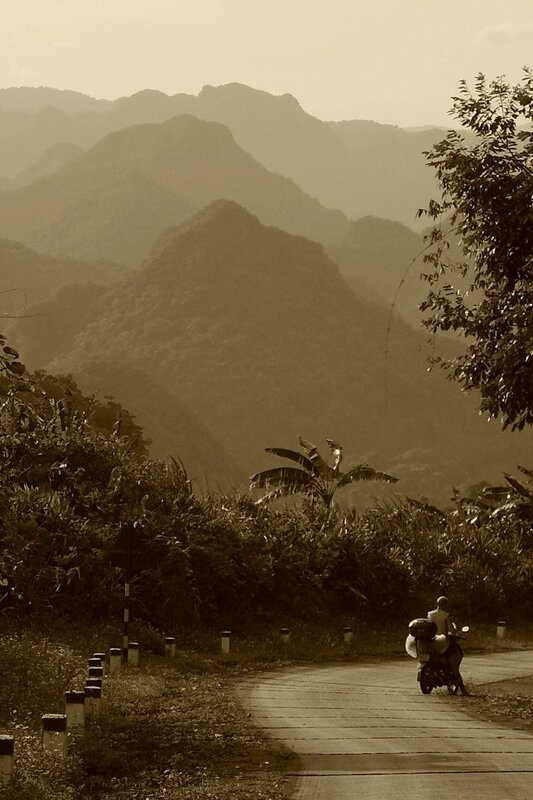 Mountains start to close in on the road, and the peak of Ngoc Linh (2,598m), the highest mountain in central and southern Vietnam, is visible to the east. Cultivation continues right to the top of most of these mountains, giving a somewhat patchy appearance to the landscape in this area (it looks as though the trees have been vacuumed off the hillsides) and reminding you that Vietnam is still a mostly agricultural economy. The road surface is a little rougher from Ngoc Hoi onwards, but it’s not so bad as to hinder progress. Rivers become clearer and mountains higher; the air damper. Many houses are made of packed mud and straw, with wood panel walls and tiled roofs. 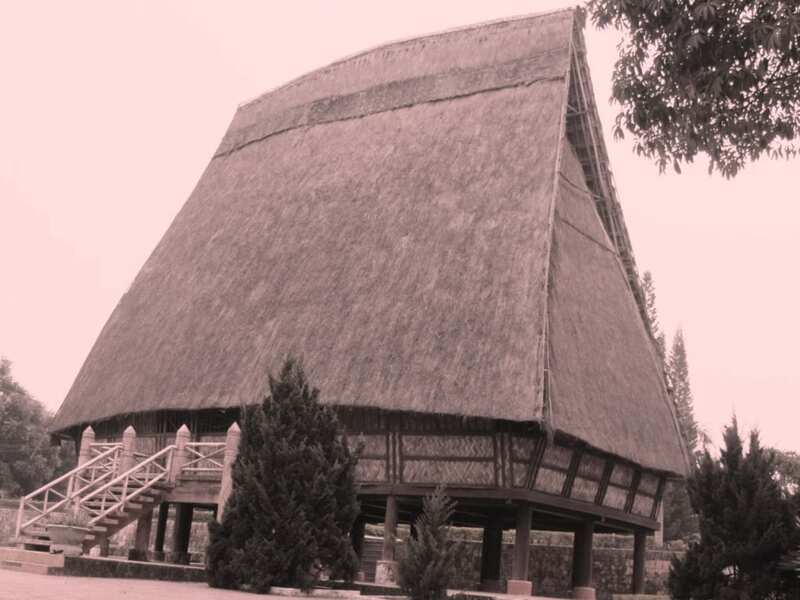 Several impressive rong houses (tall, thatched buildings which act as communal centres for many regional ethnic minorities) dot the countryside. Kids are everywhere: playing in the dusty front yards and waving at any foreigner that rides by. Dak Glei is a small, quiet place that’s good for a night. There are a couple of guesthouses and some decent eateries lining the road. Try Quynh Tu Guest House (090 359 8889) or Tuan Lan Hotel (090 520 2289), both on the main road. Deforestation reaches its peak at the beginning of the pass out of Dak Glei: the scarred mountainsides are naked, save from some lonely trees that have escaped the axe. The landscape looks like the skin of a recently plucked chicken: a few tufts and clumps of feathers left on its pink, raw and exposed flesh. Is this the fate that awaits all the great stands of forest and jungle that lie on the Ho Chi Minh Road? Thankfully, things change at the top of the pass: agriculture is pushed from the mountainsides down to the river valleys, forced there by dense tropical forests that appear to melt over the mountains like candle-wax, dripping down the steep contours and washed by relentless cascades of rain-water, draining off the mountains in gushing waterfalls, and swelling the rivers below. 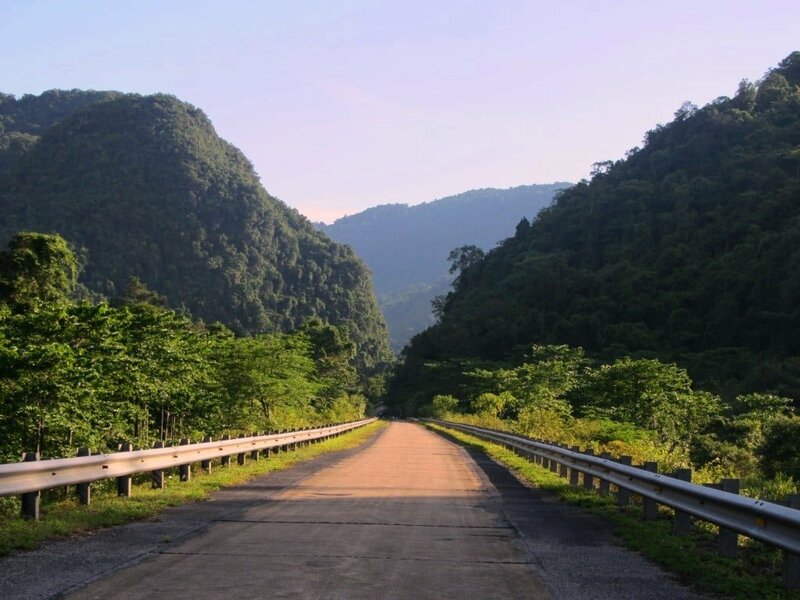 It’s a glorious ride all the way to Kham Duc, as the Ho Chi Minh Road – lined with cinnamon trees – twists up into the mountains, cutting a path through rock and along thickly forested river valleys with peaks bearing down from 6,000ft. Gold has been found in these isolated mountains and rivers, and the modest town of Kham Duc has profited from it. The gold mine, deep in the mountains, has a large staff, and Kham Duc provides accommodation for some of them, so there are a few places to choose from here. Be Chau Giang Hotel is a comfortable, alpine-lodge-style place with views over the forested mountains, or try the large new Phuoc Minh Hotel near the intersection of the highway and Phan Van Dong Street. There’s something appealing about Kham Duc – perhaps it’s the scenic setting among mountains and forests – which makes it a good place to settle for a night. Phan Van Dong is the main street, where you’ll find rice eateries, cafes, shops and the town market. Note: most people choose to drop down from the Ho Chi Minh Road at Kham Duc, heading east along Road 14E to the coast, then continuing north to Hoi An, and over the Hai Van Pass to Hue. No doubt this is partly due to the famous BBC Top Gear episode from 2007, and the popular cultural attractions in Hoi An and Hue. However, as spectacular as the Hai Van Pass is, it’s nothing compared to the passes you’ll encounter if you stay on the Ho Chi Minh Road from Kham Duc to A Luoi. (If you want to combine the Hai Van Pass and the Ho Chi Minh Road take a look at my guide to The Golden Loop). Continuing north from Kham Duc to Thanh My, the Ho Chi Minh Road follows the Dak Mi River. This quiet stretch of road straddles the valley walls, sometimes high above the river, as it makes its slow but steady progress over the boulder-strewn riverbed. However, its flow has been significantly reduced – as have dozens of rivers in this region – since the construction of dams. 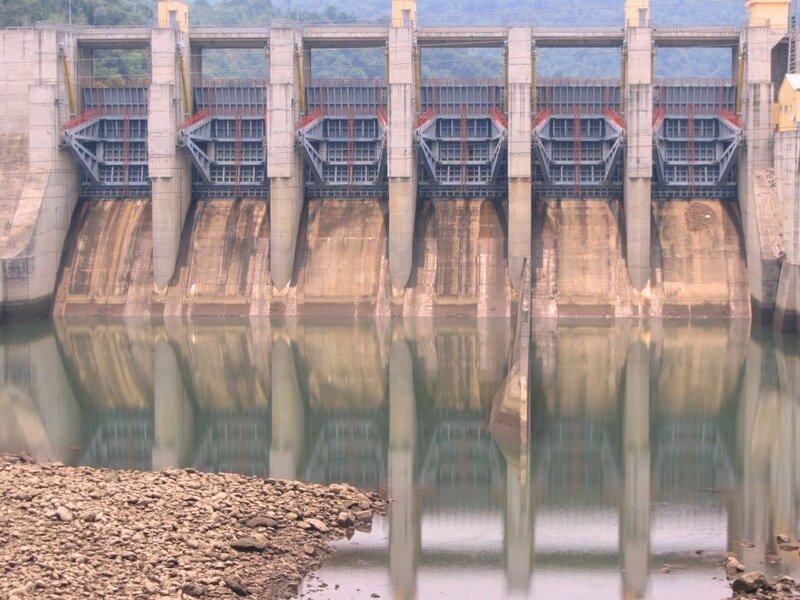 Whatever your view on hydroelectricity, it’s difficult not to feel sad at the sight of a wide, rocky riverbed whose flow is reduced to a trickle of stagnant water when once – and for millions of years before – it was a roaring white torrent surging through the jungle. At Thanh My (where you’ll find a guesthouse on the main street if needed and good food at Quán Ăn Bà Hai) bear left (due northwest) at the main crossroads, signposted to Prao. There’s very little traffic on this superb section of road. Mountain passes twist skyward, each hairpin bend revealing giant views over wide valleys, deep ravines, and mist-shrouded mountains. At times the jungle is so dense and lush that it appears to be uncontainable and threatens to grow over the road completely. A hypnotic rhythm is induced by the constant switch-backs – lean left, lean right – and the flashes of sunlight that pierce the thick foliage and streak the road at regular intervals. It’s an exhilarating – but also strangely soothing – two hour drive. Prao is a very quiet, isolated little town, but it provides everything a traveller needs: a gas station, rice eateries, shops for picnic supplies, a cafe, and a few decent guesthouses. On the main road, you’ll see Dung Thuy Guest House (051 03 898 636) and Huong Dao Rest House (0976 597 836) right next door: the former is very good; the latter is pretty run down. Huyen Long Rest House (01688 205 027) is also a good option and there’s a new guest house a minute due north out of town called Chung Thuy Rest House (0988 928 920). Cafe Su Ri serves good, strong Vietnamese coffee. Even if you’re not stopping for the night here, be sure to have some lunch or buy food supplies (there’s a mini-mart behind the gas station), and fill up with gas, because there’s very little indeed for the next 100km to A Luoi. From Prao to A Luoi is an isolated, sparsely populated and rarely used section of the Ho Chi Minh Road. 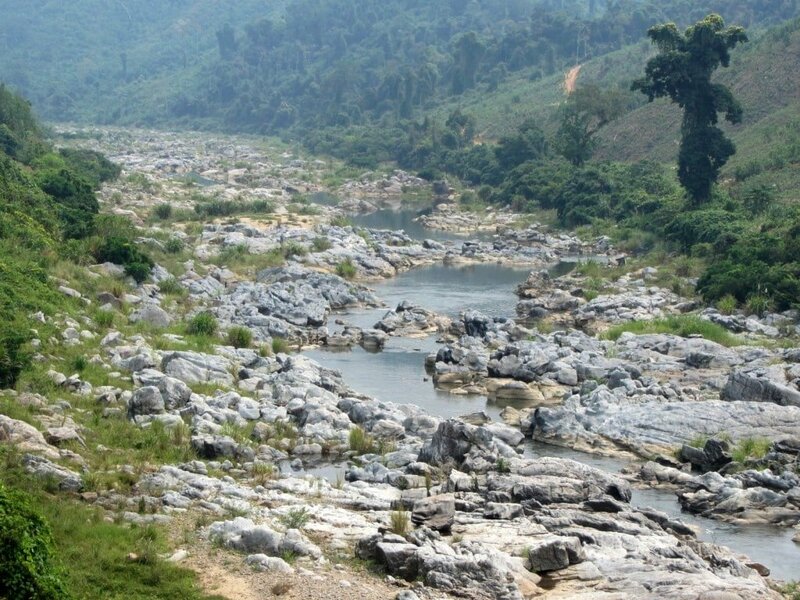 However, it’s in great shape and passes through majestic scenery, just a stone’s throw from the Lao border. Not long after leaving Prao the road begins to climb: this is the beginning of a meandering mountain pass that doesn’t really stop for the next 80km. Each time you think you’ve reached the top, it starts to ascend again. There are moments when you can see the road winding up and down the mountains in the distance before you. At times, when the road can go no higher, it simply glides along the mountain ridge; when the slope is too sheer for the road to continue, eerie dark tunnels lead under the mountaintops to the other side. The views just get better and better, and you’ll find this section of road takes at least a few hours because of all the photo stops you’ll want to make. 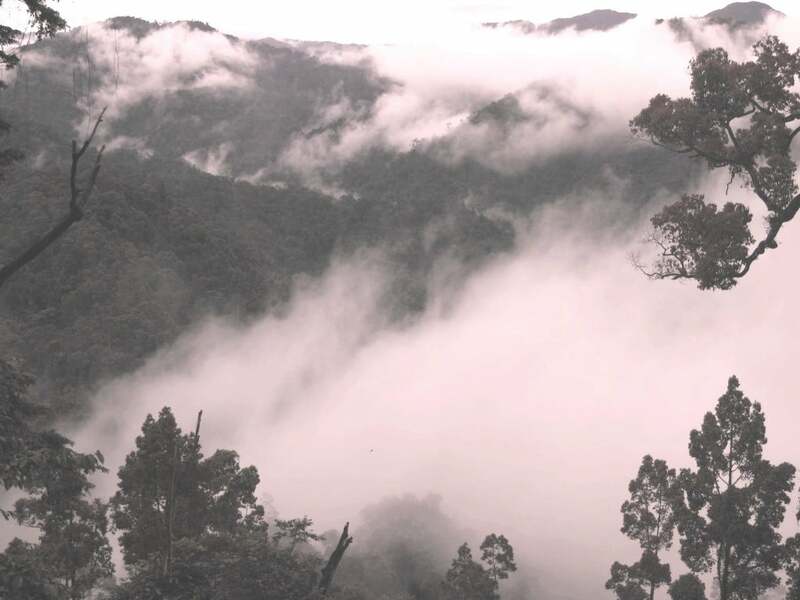 Ridge after ridge of mountains, carpeted in thick forest, appear to wax and wane behind curtains of cloud, mist and rain. There’s something almost flirtatious about it; as if the elements were tempting you with just glimpses of what would be visible on a clear day. It’s magical, and all the more so because, for the entire 100km drive to A Luoi, you can count the number of vehicles you see on one hand. There are very few man-made structures: a remote army outpost on the Lao border, temporary shelters for workman clearing landslides, and forestry protection huts. 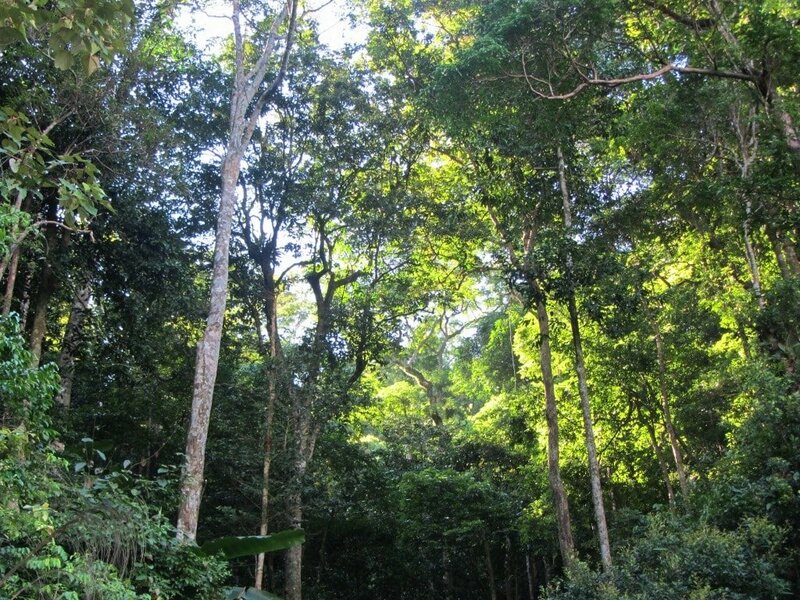 Of the latter, some are dedicated to the protection of the sao la. Also known as the Asian Unicorn, this pretty, deer-like animal wasn’t even known to science until the 1990s, and it has still never been seen in the wild by a Westerner. Very few are left, but some of the ones that are live deep in these forests. Eventually, the road drops down into a lovely, verdant valley. Agriculture takes over once more, and villages begin to appear. The land flattens and the road continues in a straight line to A Luoi, a modest town with not much to recommend it except as a night stop on the Ho Chi Minh Road. Decent, cheap rooms can be found at either Thanh Quang Guest House (279 Ho Chi Minh Road: 054 3878 362), or Do Thanh Hotel (176 Ho Chi Minh Road: 090 501 2250), or Kieu My/Duc An Guest House (303 Ho Chi Minh Road: 0905 878 059), all on the main street for around 150-250,000vnd a night. 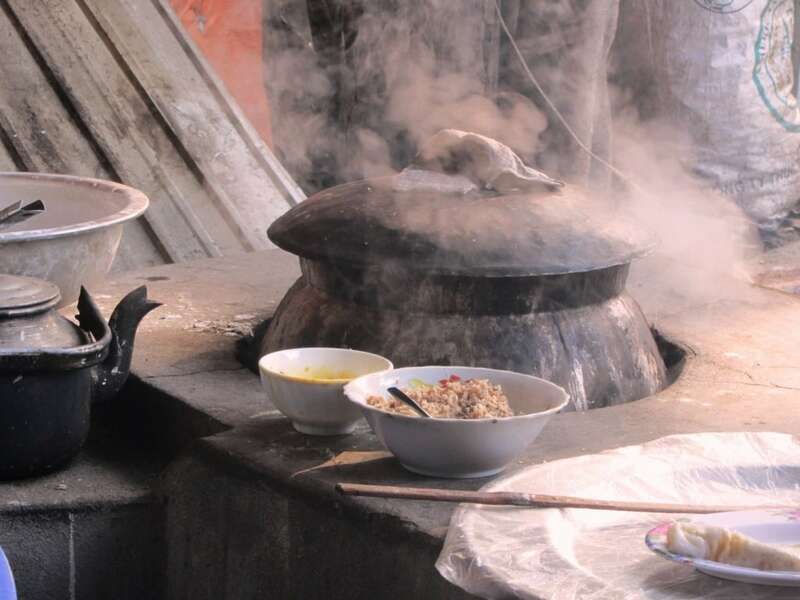 There’s a sprinkling of food and drink outlets along the main street, or try around the market, especially for a fragrant bowl of bún bò Huế (the provincial speciality) for breakfast or cơm hến (clam rice) for dinner, which is another regional favourite. There are several gas stations in A Luoi. The journey from A Luoi to Khe Sanh is a very pretty ride through an area that was once a conflict zone. Quang Tri Province is the most heavily bombed in all Vietnam. Even today, it’s estimated that 80% of land is still affected by UXO (unexploded ordnance). Now, however – as is the case with so many former battlefields in Vietnam – this area is most notable for its natural beauty and serenity. From A Luoi, the road leads through a wide valley covered in tropical trees – papaya, banana, cinnamon, pineapple, teak. 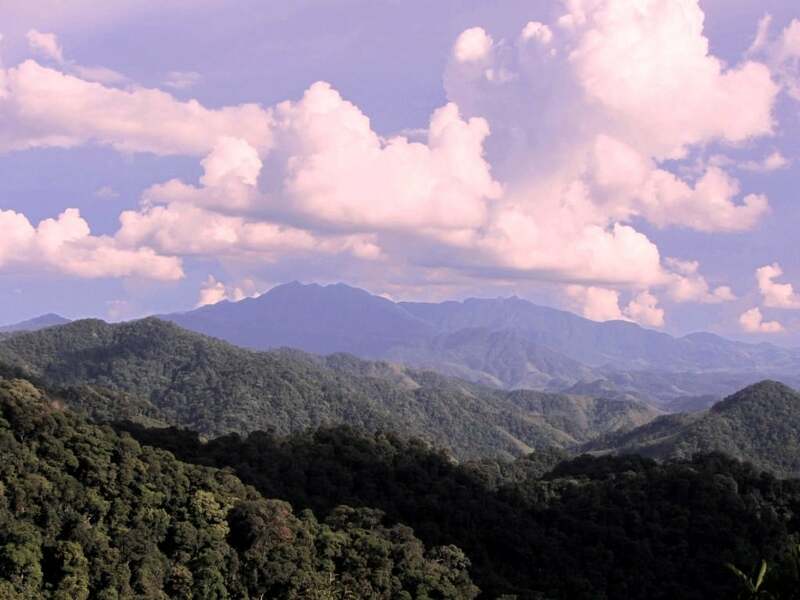 Mountains rise is all directions, and local children wave their arms in wild excitement as you pass through hamlets of wooden stilt houses: you’d never know that the barren, rounded mountain just to your left (due west) was the infamous Hamburger Hill. Of course, sites like this make you pause and contemplate the war but, happily, as the road continues up mountain passes, along glistening rivers, and the jagged Da Krong valley, it’s the beauty of the landscape and the warmth of local people, rather the tragedy of war, that causes you to stop and reflect. For the last 50km the road clings to the valley walls. The water of the Da Krong River has sculpted the limestone riverbed into ruts, tubes and crevices, as rich and varied in shape, form and texture as sea coral. 90km after leaving A Luoi the Ho Chi Minh Road crosses the Da Krong Bridge and hits Highway 9. At this point the Ho Chi Minh Road splits into two branches: Eastern and Western. Many people choose to turn right (due east) on Highway 9 towards Dong Ha and then onto the Eastern Ho Chi Minh Road. However, you’d be crazy to do this if you’re either a motorbiking enthusiast or a lover of nature and adventure. This is because if you turn left (due west) on Highway 9 towards Khe Sanh, it will bring you to the beginning of the Western Ho Chi Minh Road, which is one of the most scenic, isolated, and heart-meltingly gorgeous stretches of road in Vietnam. From the Da Krong Bridge to Khe Sanh it’s a lovely climb towards the Lao border. Khe Sanh is a dusty market town with plenty of trucks passing through on their way to and from Laos. Pretty good rooms are available at the big Thai Ninh Hotel, or the relatively new Khanh Phuong Hotel, and Hai Dang Hotel, as well as other mini-hotels on the town’s main street (try to book in advance, because these hotels often host large groups of riders). Khanh Phuong Hotel also has a rooftop breakfast cafe. There are plenty of places to eat on the main streets in Khe Sanh, and the local market is interesting to wander around and eat in the mornings. Khe Sanh coffee is, in my opinion, the best in Vietnam. Recently, several cafes have sprung up in and around town, serving the excellent local arabica beans: either Italian-style espresso-based coffees, or Vietnamese-style iced coffees. Mộc Coffee, just out of town on the Western Ho Chi Minh Road is a good place to try Khe Sanh coffee. However, in general, Khe Sanh is just a place to get some rest and stock up on supplies before the next day’s ride into Wonderland. Khe Sanh to Phong Nha (also known as Xuan Son and Son Trach) or Khe Gat is 230km/240km of winding road through incredible mountains, forests, and river valleys. It’s one of the best rides in Vietnam. There is only one hotel, hardly any shops, and just three gas stations on this entire stretch. There are very few settlements, vehicles or people. One local in Khe Sanh described it as vắng người, meaning there’s ‘nobody there’. Until recently, there were no gas stations for over 200km, so it was necessary to fill up at Khe Sanh and take a spare bottle of gas with you to refill on the road. Now days, there are three gas stations on the Western Ho Chi Minh Road (all of which are marked on my map). However, there’s no guarantee that they will be open when you pass by. Therefore, it’s still a good idea to be cautious and carry a 1.5 litre plastic bottle of petrol with you, just in case, especially if your bike only averages 100km or so per tank, because the gas stations are located pretty far from one another. Also, buy some food and drink to keep you going, as there’s precious little in the way of dining options on the Western Ho Chi Minh Road: you’ll definitely want to stop at some point for a picnic and a swim in a scenic location. With the opening of a new guesthouse in Long Son (roughly halfway between Khe Sanh and Phong Nha), it’s now possible to ride this section over two days, or you can camp along the way, which is very nice indeed if you’ve got the equipment. If neither of these options appeal to you, you will need to ride the full distance in one day. This means starting early in the morning: 240km is a long way on winding roads, especially when there’s so much fantastic scenery to stop and admire. Find the start of the Western Ho Chi Minh Road at a turning on Le Duan Street (this is the name that Highway 9 assumes when it passes through Khe Sanh) by a big, Soviet-style, sculpted war memorial. At this memorial turn onto Hồ Chí Minh Tây Street (Western Ho Chi Minh Road) heading northwest. Khe Sanh is famous for the North Vietnamese siege and bombardment of the US airbase here in 1968. Ta Con air base and museum can be visited just to the right (due east) a few minutes after turning onto the Western Ho Chi Minh Road. Several kilometres out of Khe Sanh, the road turns into large rectangular concrete slabs, which defines the Western Ho Chi Minh Road all the way to Khe Gat. After 25km the road passes through the small village of Huong Phung. This is the first of the three gas stations between Khe Sanh and Phong Nha, so fill up if you need to. There’s also a guesthouse (Hoang Phi: 0982 036 555), excellent coffee at B-Wild Cafe, and an ATM. From here it’s just a matter of letting the scenery wash over you: bend after bend, pass after pass, the landscape folds you in its peaks and valleys, rivers and forests. 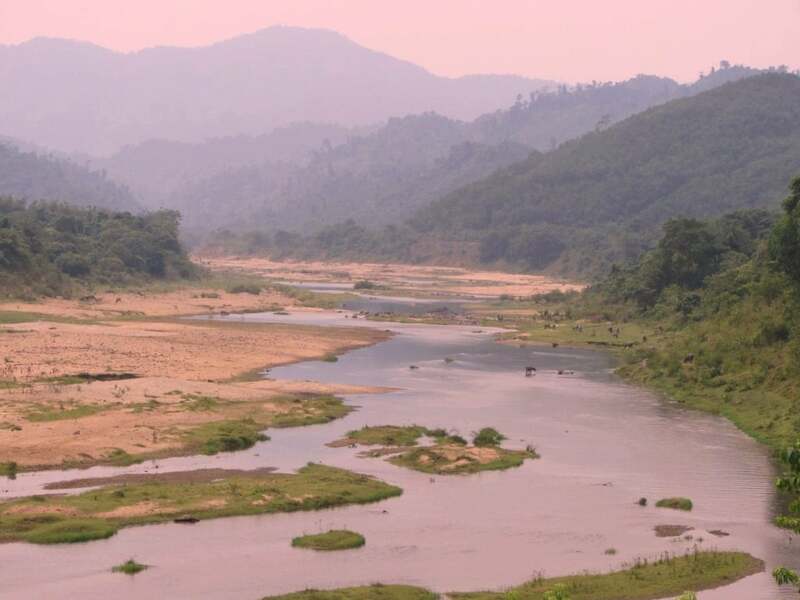 Jungles get denser, rivers clearer, mountains higher, colours become more intense, as you ride deeper into this remote area along the Lao border. Stop to shower under waterfalls, bathe in rivers, and gaze out over vast vistas as you picnic by the roadside. After 100km, you pass through Tang Ky which, although marked on milestones for hundreds of kilometres, is nothing more than a blink-and-you’ll-miss-it hamlet. This is where the second gas station is located. Roughly 30km beyond Tang Ky, after a beautiful stretch along a blue river, is the small settlement of Long Son (also marked as Truong Son). 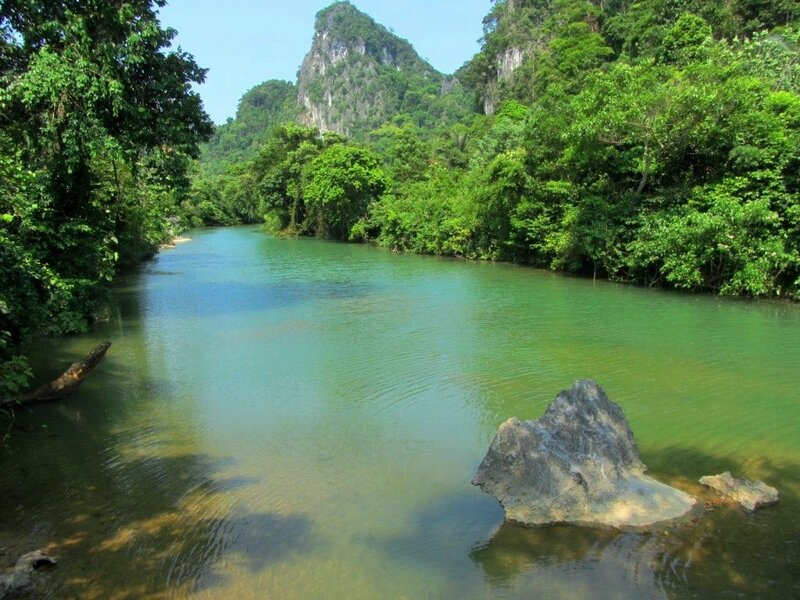 This pretty little place, in a stunning location surrounded by limestone crags, jungles and rivers, offers the only accommodation on the Western Ho Chi Minh Road. Duc Tuan Hotel (0949 522 331; rates from 200,000vnd a night) has sparse but clean rooms. There’s wifi here, a shop or two, a cafe, a few rice eateries nearby, and the third and final gas station on the Western Ho Chi Minh Road has recently opened here just south of town. The village is lovely: wood and tile homes, stone courtyards with vegetables drying outside, incense burning on family altars, children playing in the empty streets and in the river, where you can bathe and swim. This is the only place to break the journey (unless you camp) between Khe Sanh and Phong Nha. Staying at Duc Tuan Hotel in Long Son village means you can get a night’s rest on the road and therefore have more time to take it all in. 5-10 minutes’ ride due north of town, there’s a picturesque suspension bridge high above the Long Dai River. It’s a great photo opportunity and, if you scramble down to the riverbank, an excellent swimming spot. After a couple hours on the Western Ho Chi Minh Road, you’d be forgiven for thinking that it can’t get any better: but it does. Once the road enters the confines of Phong Nha Ke Bang National Park, the strange shapes of forested limestone mountains come into view. Eroded by the elements over millions of years, these mountains have been formed into soaring pillars and pinnacles, many of them resembling the crooked pointiness of wizard’s and witches’ hats. Just as a palm tree leaning out over a white sand beach has come to represent ‘tropical paradise’, so these limestone karsts have come to symbolize ‘exotic Asia’. Forget about Ha Long Bay or Ninh Binh in northern Vietnam, or Guilin in China, this is where to come for some limestone magic. Enjoy it now, while you still have it all to yourself, because big things are bound to happen here in the near future. In such a remote and geologically fascinating place as this, it’s perhaps not surprising that it was holding a very big secret. It turns out that the marvels of this national park continue under the mountains: In 2009, it was announced that the largest cave in the world, Son Doong, had been discovered here. 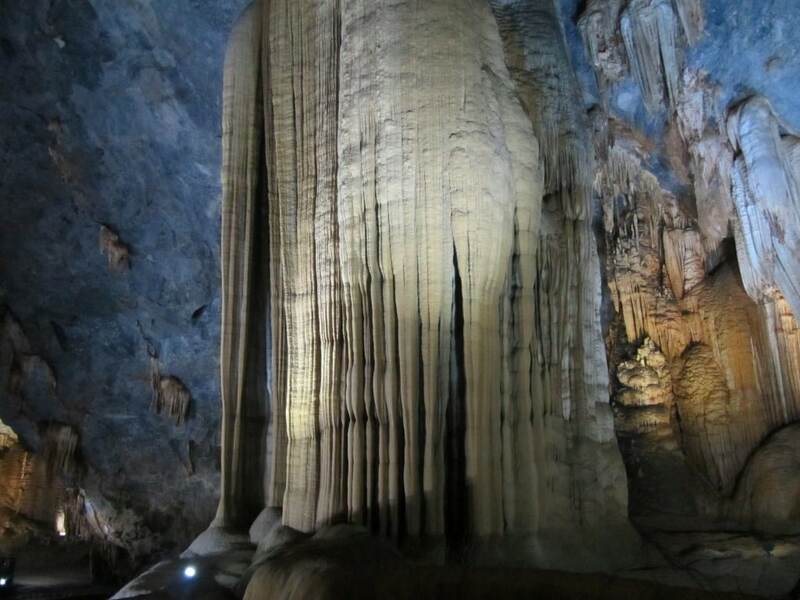 (Find out more about Son Doong Cave in this excellent National Geographic article). Oxalis Tours now offers a genuine ‘trip of a lifetime’ with a multi-day trek through the cave, including camping inside the cave. It looks and sounds extraordinary, but you’ll have to pay thousands of dollars for the privilege. You can, however, hike a little while on the trail to Son Doong Cave: the trailhead starts from the Western Ho Chi Minh Road, marked by a concrete pavilion on the roadside. However, sections of other equally impressive caves in the area (such as Paradise Cave, Dark Cave, and Phong Nha Cave) have been open to the public for years now, and they are wildly popular. These are wonderful places to visit, but try to come on a weekday (not a weekend or holiday) when the caves are less crowded. Another relatively new addition to the ever-growing caving scene in Phong Nha is Hang En, which is sort of billed as a poorer man’s Son Doong. Jungle Boss Tours and Oxalis both organize shorter and less expensive tours to this stunning, ethereal cavern, and plenty more besides. 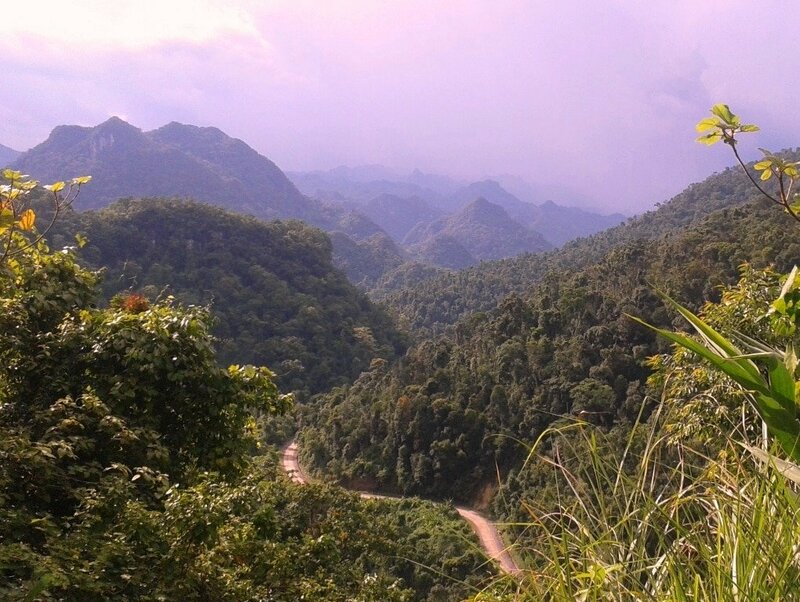 As the road passes through Phong Nha Ke Bang National Park, the air is damp, perfumed and crisp. If you’re a city dweller, like me, then it’s moments like this when you realize what breathing should be like. Despite the extremely significant natural wonders here, there’s still concern over environmental protection in the national park. At my last visit, huge tree trunks lying by the roadside and dirt logging channels on the hillsides – where trees have been felled and slid down the slope – didn’t bode well for the future of this vast but delicate stand of old-growth primary forest. As the Western Ho Chi Minh Road soars over limestone monoliths, there are sweeping views to the east, down towards the coast and the provincial capital, Dong Hoi. The closest city to the caves, Dong Hoi, is yet another hidden gem of the area. A clean, relatively peaceful city on a pretty river and a great beach, Dong Hoi is like a miniature Danang. With direct flights to Saigon and Hanoi, Dong Hoi’s star is on the rise. Flattened by US bombing 50 years ago, today this entire area – Quang Binh Province – has all the makings of a future tourist hotspot: I’d visit now so that, in 10 years’ time, you can say you saw Quang Binh before the crowds arrived. 215km after leaving Khe Sanh there’s a bridge over a river before Tra Ang crossroads. If you continue straight ahead here (due north) it takes you to Paradise and Dark caves, and along a beautiful river before joining the Eastern Ho Chi Minh Road at Khe Gat. Alternatively, turn right (due east) towards Phong Nha (also known as Xuan Son and Son Trach). After 15km the road meets a blue river lined with limestone karsts: this is the town of Phong Nha, gateway to the caves. As grand as it sounds and as pretty as the surrounding scenery is, the town is not a particularly attractive place. It’s a work in progress; somewhere between its serene past as a small village in the countryside, and its future as the resort town for the largest cave system in the world. Dust, construction, rip-offs, and Western food joints abound. However, there’s a decent range of accommodation (see below), and the limestone Wonderland you passed through during the day can still be glimpsed from your balcony. The town of Phong Nha is chock-full of mini-hotels and backpacker hostels. 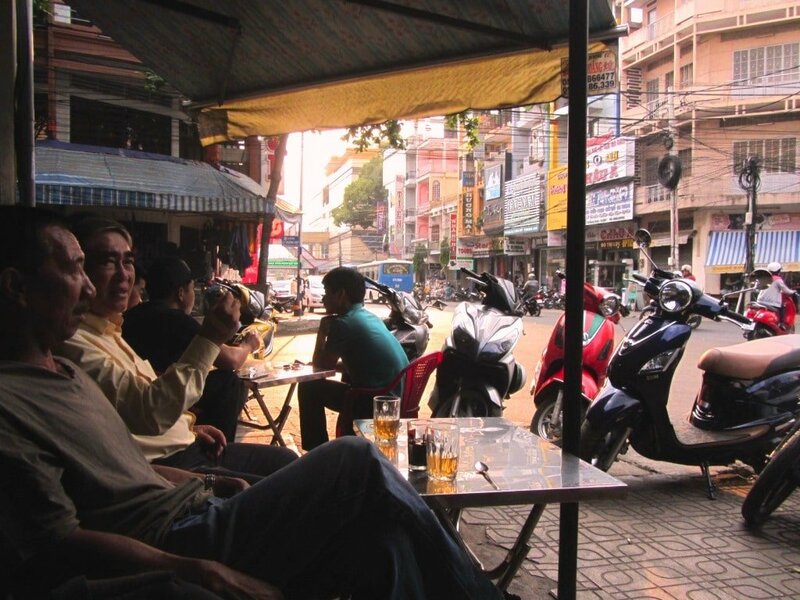 Popular budget digs on the main drag include, Easy Tiger Hostel, Nguyen Shack, and Gecko Hostel. Pricier but more comfortable and atmospheric options are located further down the road along the river, such as Jungle Boss Homestay, Phong Nha River House, and Ho Khanh’s Homestay. 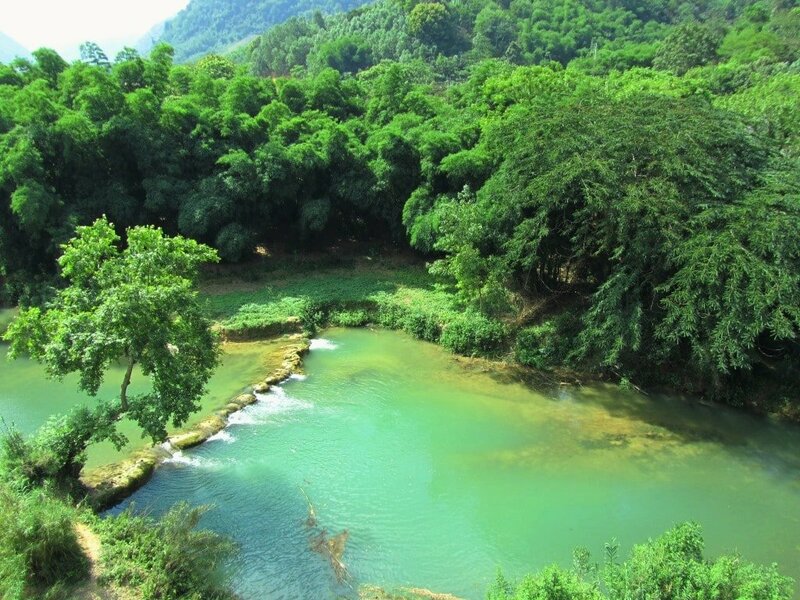 However, it’s much nicer and more peaceful to stay in the rural homestays located in the serene countryside on the northern side of the Ho Chi Minh Road (QL16) rather than in Phong Nha town itself. Sy’s Homestay and Greenfield Ecostay are good examples of this. Even further east of Phong Nha along the Ho Chi Minh Road there are more excellent mid-range accommodations: Phong Nha Farmstay, Phong Nha Lake House Resort or Pepper House Homestay are all very good. Phong Nha’s main street has an increasing number of backpacker-oriented bars, diners, and English-speaking mechanics if your bike needs maintenance. Most of the homestays provide delicious home-cooked food. There’s a brilliant, informal, local BBQ spot just north of town called Quán Bình Hoa. Go around dusk and feast on spit-roasted pork ribs and duck. High quality Vietnamese coffee is available at Phong Nha Coffee Station, and it’s hard to beat a gin and tonic at the Bomb Crater Bar by the river. There’s a gas station in Phong Nha town, on the left just before joining the Ho Chi Minh Road. Head east on Phong Nha’s high-street for a couple of kilometres until it meets the Ho Chi Minh Road. Turn left (due northwest) to begin the journey to Huong Khe and Pho Chau. Almost immediately, there’s a great view over the river back towards Phong Nha town, which looks better from afar than it does when you’re actually in it. The 100km stretch from Phong Nha to Pheo (Tan Ap) continues in much the same way as the previous couple of sections: more jagged, jungle-clad limestone forests stretching to the horizon; more majestic mountain passes climbing above the dense, shimmering jungle canopy; more clear blue rivers cutting valleys through the limestone; and more small villages where everyone comes out to wave as you ride by. In fact, many people I ride with consider this to be the most scenic section of the entire Ho Chi Minh Road. There are numerous places to stop and gaze in awe at the limestone landscape and, if you’ve got time to do some exploring, there are dozens of small paved lanes leading off the highway through idyllic-looking hamlets of wood and thatch houses, and terrific swimming spots in aquamarine rivers below jungle-clad limestone cliffs. Sadly, freight traffic has started to increase on this bit of the highway. This, I suspect, will only get worse, as truck drivers realize that the Ho Chi Minh Road from Hanoi all the way down to Dong Ha is a much better alternative to taking Highway 1. However, it’s still nowhere near busy….yet. Slowly, as the day goes on, settlements get bigger, concrete houses replace wooden huts, agriculture swallows up the forests, mountains give way to flat valleys, and traffic increases slightly. There’s still some great scenery – rubber, tea and cinnamon plantations, and the misty, forested slopes of Vu Quang National Park to the west – but when compared to the dramatic landscapes of the previous few days, it seems tame and tainted. Huong Khe is a surprisingly big and lively settlement with a large lake, lots of food and accommodation, and a deafening chorus of cicadas in the evenings. Huong Khe’s high street runs parallel to the Ho Chi Minh Road, so you have to take one of many connecting streets between the two. Son Ha Hotel and Hoang Ngoc Hotel both have good rooms by the lake, where there’s lots of beer and food stalls at night. 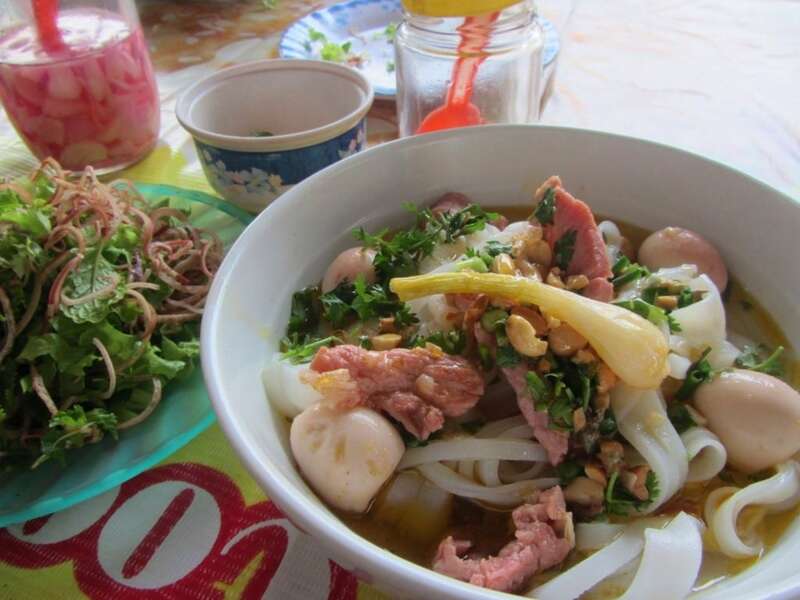 For breakfast, head to the market and try the fresh, thick, doughy bánh canh noodles at 406 Tran Phu Street, near the corner with Nguyen Hue Street. From Huong Khe to Pho Chau it’s easy to make a wrong turn onto Highway 15 towards Ha Tinh City: at the junction make sure you bear left, signposted to Vu Quang. It’s a very green ride to Pho Chau, and the Ho Chi Minh Highway is incongruous to the life and landscape surrounding it, which seems to belong to another century; a time when people used buffaloes not cars, and bamboo not plastic. The lush and seductive slopes of Vu Quang National Park abut the road, where some of the last remaining wild Indochinese tigers roam. These forests are also where Phan Dinh Phung fled, to muster a resistance force against the colonial ambitions of the French, in the 1880s. At the crossroads with Highway 8 turn left (due west) for the small town of Pho Chau. This is a dusty, off-the-beaten-path place to spend a night. The town centre is at the crossroads before crossing a bridge. Here you’ll find a couple of OK hotels for a cheap night’s rest: Bach Dai Dung Hotel (039 3875 490; rates from 150,000vnd a night) and Ngan Pho Hotel (039 3516 678; rates from 200,000vnd a night). There are food stalls around the market. However, if you stay on the Ho Chi Minh Road past the Pho Chau intersection, there’s a new hotel (with a swimming pool!) just five minutes up the hill. Minh Tu Hotel (rates from 250,000vnd a night) is more comfortable and better value than staying in the town. Pho Chau is on the road to a remote border crossing with Laos, and the only bit of notable information about the town that I’m aware of, is that it’s the first stop in Vietnam for all the trucks full of dogs that have been illegally smuggled in from Thailand via Laos, and destined for the tables of restaurants in Hanoi. This is a ride through the neck of Vietnam or, as I like to think of it, the throat of the dragon. 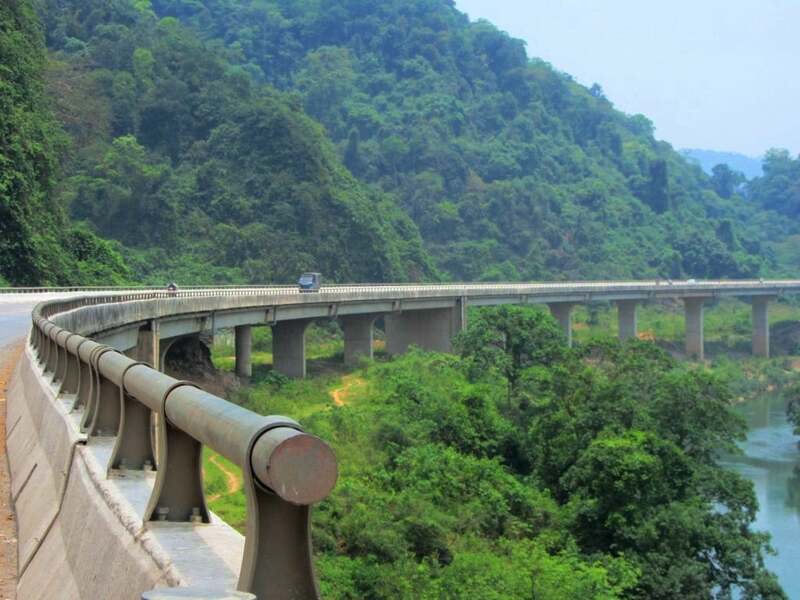 The Ho Chi Minh Road spears its way through Ha Tinh and Nghe An – vast provinces of forests, fields, farming and rivers – following the railroad north. These wide agricultural expanses hold little interest to most foreign travellers, but this is the revolutionary heartland of Vietnam. 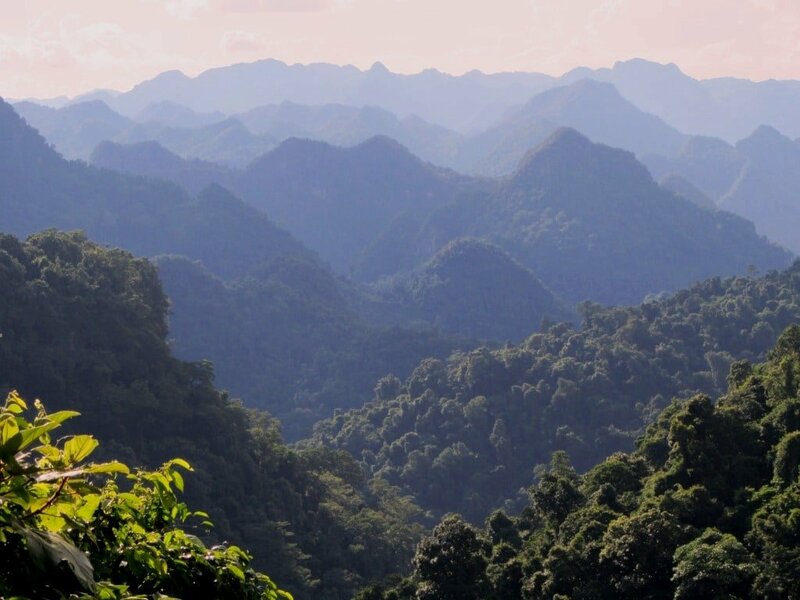 The Ho Chi Minh Trail – the wartime supply route from north to south – started from Nghe An Province, before plunging into the jungles and mountains of Laos. This section is easy, swift riding, making it possible to cover large distances in just a day or two. On the way, you’ll notice several roads spreading west of the Ho Chi Minh Road. If you have time, follow some of these Laos-bound routes, as they offer some of the most isolated and beautiful scenery in Vietnam. Not far out of Pho Chau town, the road passes a Vinamilk dairy farm. Milk and yogurt are hugely popular in Vietnam, which has made Vinamilk one of the biggest companies in the country. (Rather worrying, there’s not a cow in sight.) Wending its way through a rolling landscape – blanketed in eucalyptus, lemongrass, sweetcorn, cassava, cinnamon and tea – the Ho Chi Minh Road leaves Ha Tinh (the Province of Rivers and Peace) and enters Nghe An, the largest province in Vietnam, but one of the least visited by foreign travellers. Known as ‘Nghe An Buffaloes’ (because of the hard labour involved in working the land and the harsh climate they must endure throughout the year – massive heat and typhoons in the summer; cold and bleak days in the winter), the people of Nghe An are known for their resilience. Indeed, this province has produced some of the biggest names in the Vietnamese history of revolution and resistance, chief among them being a certain Ho Chi Minh, whose childhood home is a short ride to the east of his namesake’s road. It’s a big province, and the journey across Nghe An’s vast agricultural landmass can be long and monotonous, but the road is in great shape and traffic is light. You’ll find hotels, food, gas and supplies at fairly regular intervals. Tan Ky is a good place to break the journey if you need a lunch stop or to spend the night. There are lots of nhà nghỉ (local guesthouses) signposted from the road here, but by far the best accommodation is the KM0 Hotel (038 3979 888; rates from 300,000vnd a night) at the main intersection. This smart place seems a bit out of place here, but it’s a welcome oddity. Next door, the Truong Son Hotel (038 3882 457; rates from 200,000vnd a night) offers cheaper rooms. There’s lots of rice and noodle eateries lining the road. Tan Ky is notable as the start of the Ho Chi Minh Trail: there’s a monument and small museum across from the KM0 Hotel. There are also guesthouses and hotels at Khai Son, Thai Hoa, and Yen Cat. North of Tan Ky, the Ho Chi Minh Road is in a bad state. Expect fairly frequent but minor roadworks for about an hour on this section. Coupled with the roadworks, brick factories, trucks and dust make this little stretch a bit unpleasant. But, when the Ho Chi Minh Road enters Thanh Hoa Province, limestone karsts appear on the horizon, bamboo grows on the hillsides and the road is smooth once again. A good little place for a night is Lan Anh Hotel (037 8996 886; rates from 250,000vnd a night). The hotel is located a short way from the birthplace of another hero in the Vietnamese pantheon, Le Loi. Born in 1384, Le Loi led the uprising (1418-27) that expelled the Ming Dynasty Chinese from Vietnam, and established Le Loi as the first emperor of the Later Le Dynasty. He achieved this with the help of a special sword which, after the Chinese had been defeated and the sword had done its work, a turtle in Hoan Kiem Lake in Hanoi took back from Le Loi: this is where the lake gets its name, Lake of the Returned Sword. Le Loi’s home citadel and temple can be visited in Lam Son, near the Lan Anh Hotel. A wall of limestone karsts greets you as the Ho Chi Minh Road reaches Ngoc Lac, hinting at what lies beyond to the west, on the Limestone Loop and in Pu Luong Nature Reserve. There are lots of nhà nghỉ and hotels lining the road around Ngoc Lac if you need somewhere to stay. Thanh Hoa Province is also the home of the Dong Son civilization, a bronze age culture dating back nearly 3,000 years. The Dong Son centred around the Ma River, a mystical body of water snaking sluggishly through limestone outcrops, in whose caves the Dong Son lived. At Cam Thuy, there are great views of the Ma River from the bridge. This is also a good place to spend a night. Try Thanh Nhan Hotel (037 3280 555; rates from 250,000vnd a night), on the right just before crossing the bridge. Rooms are good and the hotel is set around a pleasant courtyard. If you prefer to be in town proper, there are some hotels and guesthouses lining Cam Thuy’s high-street, where there’s also plenty of food. For breakfast, try to find Ms Thai’s bánh cuốn shop (steamed rice flour rolls): it’s near the centre of the main street, opposite Phuong Spa and next to a big red shopfront for Tiem Vang Hai Ngoan. Leave Cam Thuy on the Ho Chi Minh Road heading north. Just after the bridge, Thanh Nha Ho is signposted to the right (due south-east). Thanh Nha Ho is an ancient citadel dating to the early 15th century. The citadel walls are imposing and in an attractive state of decay among farmland. It’s an interesting 25km side trip if you’re in need of some history and culture (read my guide to Ho Citadel here). 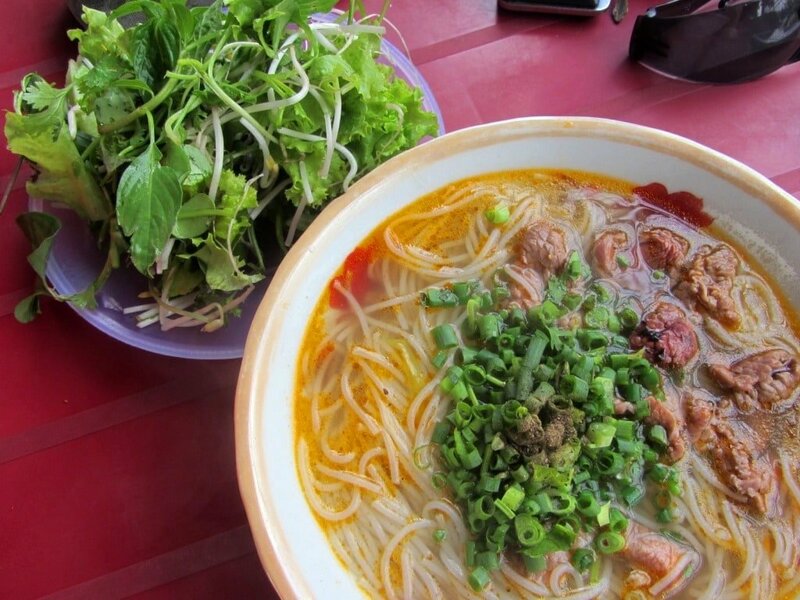 While riding through Thanh Hoa Province, make sure to stop and pick up some nem chua Thanh Hóa. 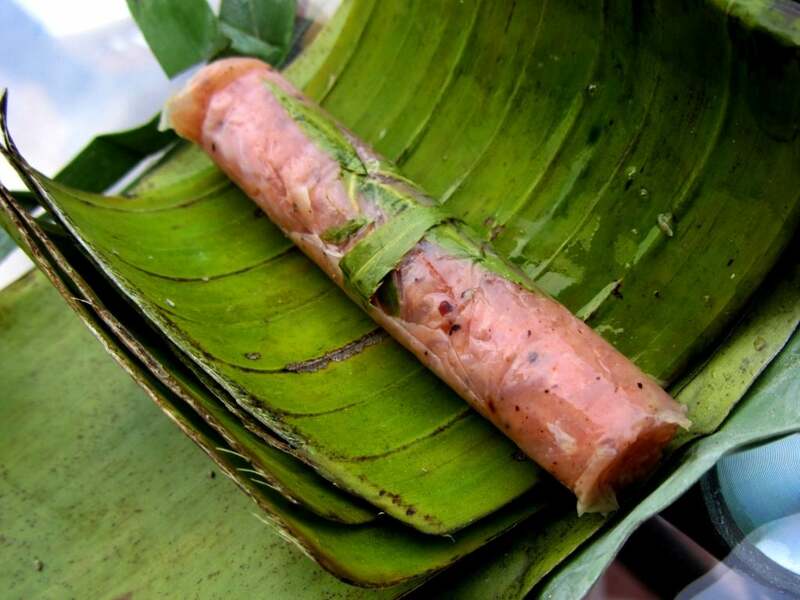 These are delicious pork salamis wrapped in banana leaves with garlic and chilli. They are sold in bunches of about a dozen by the roadside. Several places all over Vietnam specialize in nem chua but these, in my opinion, are the best. Not ten minutes out of Cam Thuy, the Ho Chi Minh Road plunges into what appears to be the set of Jurassic Park. 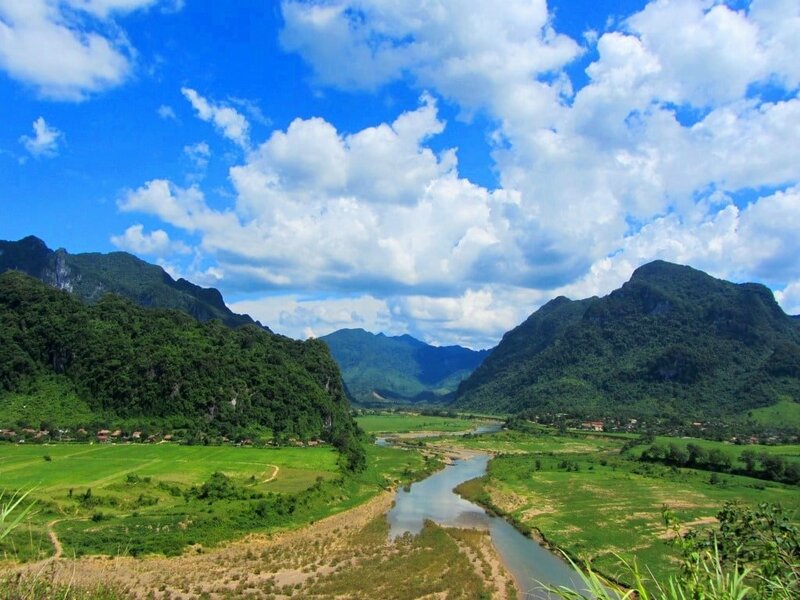 This is Cuc Phuong, declared Vietnam’s first national park by Ho Chi Minh himself, in 1962. Characterized by forested limestone cones, the Ho Chi Minh Road cuts straight through the park, following the course of the turquoise Buoi River, as it swerves between rocky peaks. 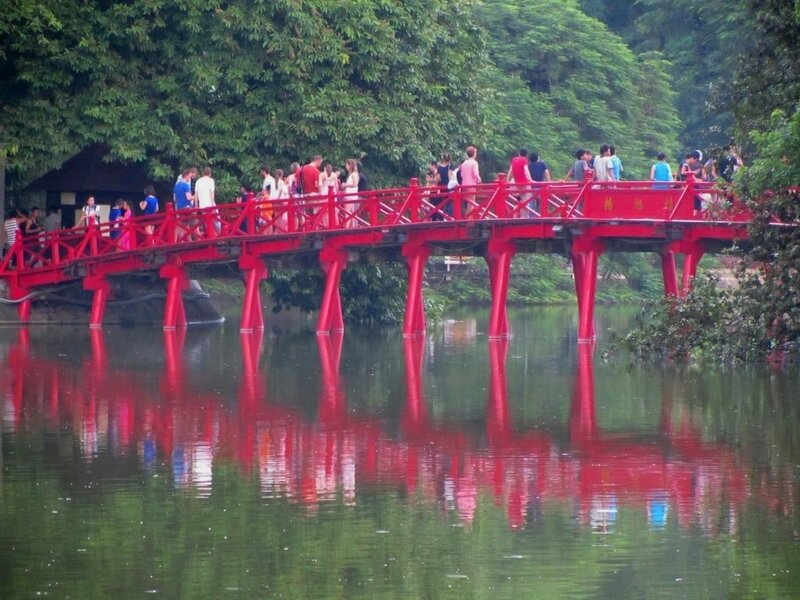 Although the park entrance is some 50km to the east, you can get a good taste of Cuc Phuong by staying at Quang Duc Homestay (70,000vnd per person per night), on the left just after crossing the first bridge. Sleeping is on mattresses on the wooden floor under mosquito nets in a stilt house. The food is also excellent here and staff are hospitable. The only problem is that passing trucks during the night slightly spoil the ambience. The homestay is near several swimming spots. The first is down the dirt road (soon to be paved) just beside the homestay. After a couple hundred metres there’s a weir where you can swim lengths or jump off rocks and branches into the water. A good 10-15km further up this road, there’s a makeshift sign for ‘Thác mây‘, Cloud Waterfall. 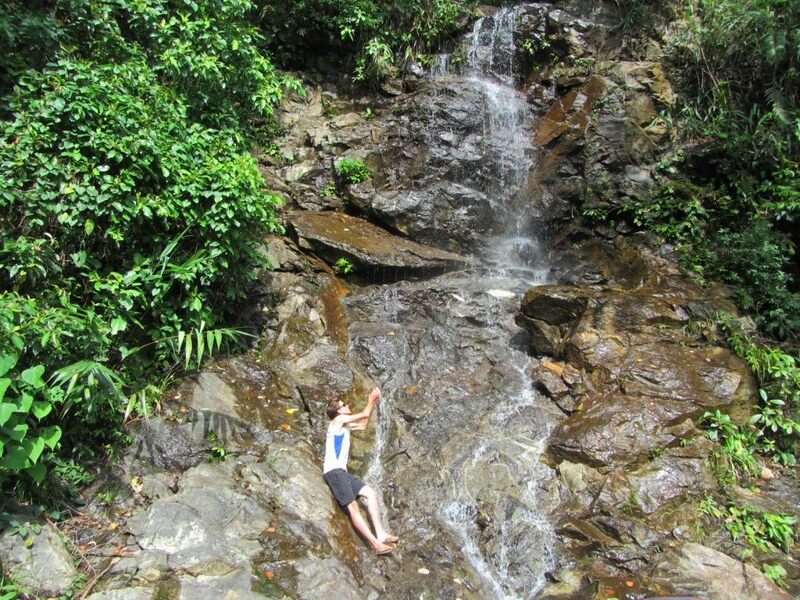 Up a steep and slippery slope, these falls are a terraced cascade of gin-clear water, creating perfect bathing pools. It’s a special place and, if you come during the daytime on a weekday, you may have it to yourself. 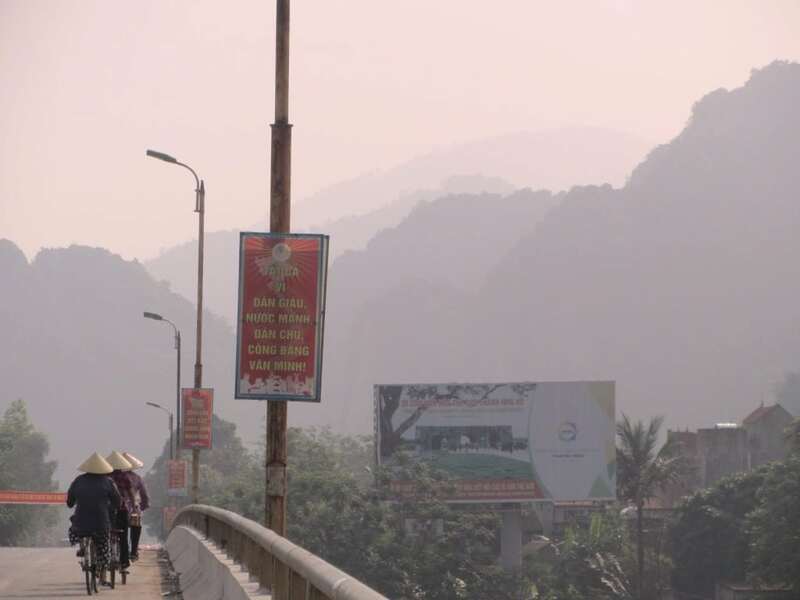 Continuing north from Quang Duc Homestay, the Ho Chi Minh Road glides through the jungled hills of Cuc Phuong on an impressive elevated roadway. The procession of limestone hills continues on both sides of the road for a long time after passing through the park. To the east is Ninh Binh. 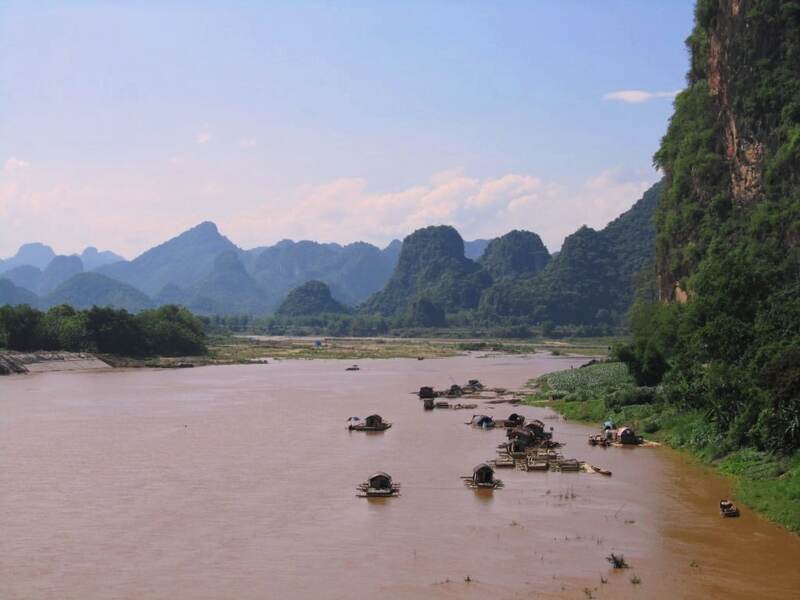 Famous for its mysterious landscapes that have recently been used in Hollywood movies (such as Kong: Skull Island, which is to be released in 2017), Ninh Binh is connected to the Ho Chi Minh Road by several potholed back-roads. Although the scenery remains good, it’s blighted by many large brick and cement factories, which are destroying the landscape by quarrying deeper and deeper into the hills. There are also minor roadworks and rough patches, largely due to all the trucks that ply to and from the quarries and the factories. 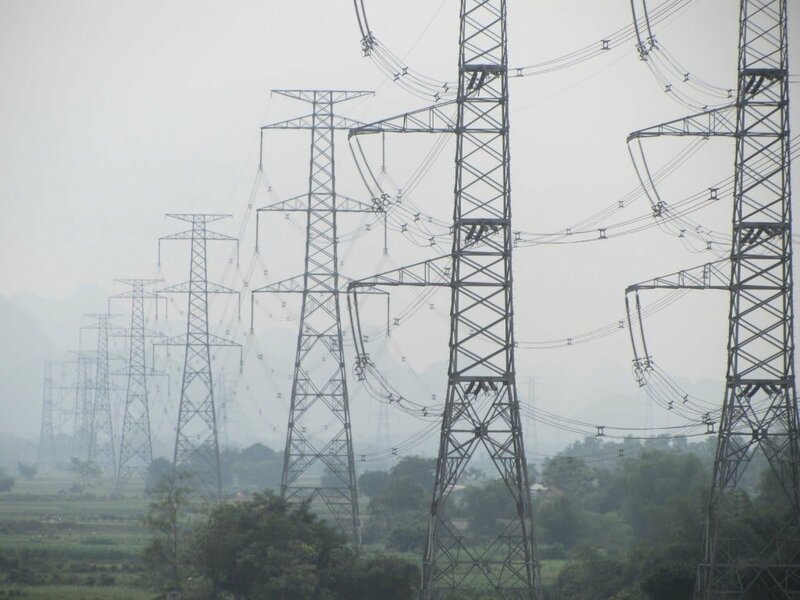 Settlements get larger, soot and dust hang in the air, and it’s not long before the inevitable march of trucks clog the road around the industrial suburbs of Hanoi. The last 50km to Xuan Mai and Hoa Lac can be a very nasty, dirty ride indeed. There are plenty of nhà nghỉ guest houses by the road in Xuan Mai if, for some reason, you had to stay there. At Hoa Lac, the end of the Ho Chi Minh Road, turn right (due east) onto the Thang Long Expressway towards the capital. (Avoid taking Highway 13 from Xuan Mai to Hanoi, it’s nasty). The expressway is in excellent shape and, if you were feeling depressed by the slow crawl through the industrial outskirts, the sight of central Hanoi is certain to lift your spirits. The serene waters of Hoan Kiem Lake signifies the end of a memorable 2,000km road trip from south to north Vietnam. For great value flashpacker beds try Hanoi Impressive Hotel, where rooms with balconies sometimes go for $35; for chic, boutique mid-range rooms try Silk Path Hotel; or reward yourself with a night in a lake-view room at the new Apricot Hotel. This entry was posted in ALL, Central, MOTORBIKE GUIDES, Mountains, South to North and tagged guide, Ho Chi Minh Highway, Ho Chi Minh Road, motorbiking, travel, Vietnam. Bookmark the permalink. Thanks a lot for the update, I appreciate it. First I just wanted to say thank you for the guides! They have made my time in Vietnam a breeze so far with so much helpful insight about what to see along the way! I’m currently in Hue and have been riding up the coast since Saigon pretty much other than Da Lat. I really want to go on the West Ho Chi Minh highway to get away from the coast and seem something a bit different. Only thing is I’m worried about my bike. I bought it in Saigon, it’s clearly old and on replaced parts and I’ve had to replace two things on it already. I’m a bit nervous that in the more isolated areas you’ve talked about in the western side I won’t be able to easily find someone who can fix my bike. What are your thoughts on this? Is it still relatively easy in the isolated areas to find someone who can do the work? Well, it is isolated on the Western Ho Chi Minh Road between Khe Sanh and Phong Nha, but there are some villages along the way, and in Vietnam you’re never far from people who know how to fix bikes. You should definitely make sure your bike is in good working order before you head up there, but the worst case scenario if you were to have a break down on the Western Ho Chi Minh Road is simply that you’d need to wait for a bit by the roadside until some one comes by and you wave them down for help. People will almost certainly stop and try to fix the problem or give you a lift to someone, somewhere who can help you. Which route would you suggest me from Hanoi to Pho Chau? You can just follow the route in this guide (see the map) – it goes west of Hanoi on the Thang Long Highway, then south on the Ho Chi Minh Road all the way to Pho Chau. Thank you for the great blog with all the important information. Great work, keep it up. I was planning to follow mostly your description of the Ho Chi Minh Road in late November, early December. As I got only to weeks to ride it, I wanted to ask you if that is possible hurrying too much (maybe also with a little detour to a coast somewhere) and how the weather is going to be (especially in the central part, as I read there can be quite a lot of rain in autumn/winter). And if the weather might cause some serious delays. It’s not really possible to ride all of the Ho Chi Minh Road in just one week, unless you ride all day, every day, but that wouldn’t be very fun. Also, at that time of year, the weather anywhere north of Danang can be quite grey, rainy and surprisingly cold, too. Therefore, I would suggest just riding the southern part of the Ho Chi Minh Road, from Saigon to Dannag. Or maybe this about the Coast Road, too. Thanks for the reply. I meant to write two weeks. That should be possible, right? Even with the bad weather? Yes, two weeks is possible. The rain could slow you down, or if it’s really bad then it could close parts of the road between Prao and Phong Nha, because this section is very mountainous and therefore may suffer landslides and flooding in heavy rains. I’m at the Bach Dai Dung Hotel in Pho Chau (end of Section 6) and I just want to point out that their minimum is now 170K – it’s posted on a sign at reception (next to their hourly rates…) so it’s not just me being ripped off – and I’m curious to know what your standard of an “okay hotel” is, as this sunless room is dirty, comes with stained sheets and pillows, has a broken AC and reeks of cigarette smoke. 😛 I think this might be the worst place I’ve stayed in three weeks of traveling through Vietnam! Yes, ‘OK’ means not great but will do for a night, and very cheap. If you want nicer accommodation it’s best to go to Minh Tu Hotel & Resort just out of town on the Ho Chi Minh Road, as mentioned in the guide. I hope the ride into Hanoi goes smoothly. I used this as the basis of a trip we took from Da Nang to Hanoi. We deviated in a few places to visit places I was keen to go to. The scenery was incredible, and the points of interest included on the map were really helpful. I could only find two things that may need updating – The Ho Citadel price is now 40,000VND when approaching from the South. Nobody seems to care about anything from East or West, and the North gate barrier was down but ignored by everybody. The Minh Tu hotel just outside Pho Chau was lovely, but we were initially put off when booking.com and agoda both showed no availability. Curiously we found the same hotel listed as Hai Thuong Eco Resort and reserved a room. Thanks again for all your hard working putting the guides on this website together, they have been really very helpful. I hope to test some more of them out in the future when I return to Vietnam! The extra detail and bits of history and cultural information are also very appreciated. Great to hear about your road trip and that my site helped you out along the way. Thanks for the updates. Strange about the two different names for the same hotel – I think the other name was its previous incarnation and they just haven’t updated the information yet. And thank you for your kind donation to my site, I really appreciate it. Would you be able to send me your rough itinerary you did for this trip and how long it took? I’m actually planning on doing the same thing for roughly a week idk if it would be doable what are your thoughts? You can spend as long or as little as you like riding this route. If you want to work out how long you might take to ride it, consider that an average spend on the Ho Chi Minh Road is about 50km per hour. The total distance between Saigon and Hanoi is 1,880km. So if you only have one week you’d need to cover over 250km a day. This is doable but it will be a lot of riding and quite tiring. Thanks for the response Tom! I figured this route would be a little overwhelming to accomplish in a matter of 10 or so days I have, so I was actually looking to start from Hoi An and finish in Hanoi. I have a rough draft of what I would be accomplishing each day. Would you be able to look into it and give me some feedback? The day 9 would be starting in Ninh Binh to Finish in Hanoi! Yes, that itinerary looks good, and the distances are comfortable for each day’s riding. It’s still a good idea to leave at a decent time in the mornings everyday, though, because you never know what the weather will be like, or any unforeseen circumstances, such as break downs, or bad road conditions. Thanks for your response Tom! I only have about 10 days for a motorcycling journey, and I plan on starting from Hoi An to Hanoi just like Mr. McKeand did above. I actually have a rough draft of what I will be doing averaging 136km longest day riding would be 176km. I would like some advice on how this would be accomplished. Here is a link to my Trip Itinerary! thanks a lot for this and all the other guides on your website. If it wasn’t for them, I probably would’ve never gotten the idea to do some motorbike trips through Vietnam. I started off with riding through the Central highlands along the Truong Son Dong, went through parts of the Golden Loop and finished the journey with the Western Ho Chi Minh Road. Just to let you know: Between Khe Sanh and Phong Nha there is a new gas station now in Cầu Tăng Ký, at the QL15 just north of the crossing with the DT10. Thanks very much for the update. I’m actually on the Ho Chi Minh Road near Khe Sanh right now so I’ll be able to update the guide soon. Great to hear that you enjoyed your road trip. Hey, I’m a novice rider (some experience with dirt bikes on friends farms ~5 years ago) and I’m planning on taking the trip from Ho Chi Minh City to Hanoi in a couple of months. I want to make sure I’m doing this as safely as possible, so I’ve decided to take this route and completely avoid Highway 1 as I don’t feel confident riding it. That said, what are the main areas you’d think I would have to look out for on the Ho Chi Minh road? I’m planning on keeping a steady pace at 30-40 km/h and purchasing some proper motorcycling gear, with this in mind am I going the right way about making the trip as safe as possible? Well, the first hour or so getting out of Saigon is always pretty bad. You can leave very early in the morning or late at night to avoid it, or anytime of day on a Sunday. After Dong Xoai the Ho Chi Minh Road really opens up, but between Buon Me Thuot and Kon Tum there are a fair amount of trucks and buses on the road, so be careful. After Kon Tum it’s great riding and light traffic for most of the way until you get beyond Cam Thuy in the north, then the traffic and the trucks start to increase as you get closer to Hanoi, making the last couple of hours pretty grim. But ride slowly and carefully for those sections and you should be fine. In general, outside of the large cities, riding in Vietnam is not so bad, but in the big cities it can be very chaotic if you’re not used to it. You should be aware that many of the road rules you’re familiar with from your home country will not apply – or at least people don’t follow them – when in Vietnam. Don’t assume anything and always stay alert. It might seem difficult for the first few days, but after that you will get used to it and start feeling much more comfortable. A technical question this time. Do you know we can download your google maps route to our phone so we use it offline or at least have it saved for future use or ease?? First get the Maps.me app on your phone. Then open one of my guides (like the Ho Chi Minh Road guide) on the browser on your phone. Click on my map in the guide. Click the map title (which is usually at the bottom of the screen on mobile). Then click the three vertical dots at the top of the screen. This will open some options. Click ‘Download to KML’ and ‘Open’. This should open the map in the Maps.me app which means you can follow it offline. Hi Tom, Still having a little trouble. I have map.me using on an Apple 7. I am on the map through safari. At the top of the map there is the 3 dots in a < symbol. Which if you click gives you the options to share to social media or messages. If I view in a larger map and login with google it doesn't help either. So essentially I cant find the download to KML anywhere. Sorry – forget that – Got it resolved. 🙂 Good to hear you got it sorted. This website is fantastic and you deserve a lot of credit for what you have done! I am off on ride from Hanoi to HCMC in 3 weeks. Its all planned and we will be following your routes the majority of the way. I just wanted to ask if there has been any new things to be aware of. For example roadworks, a landslide, a recommendation to take a different route because of the time of year etc. I haven’t heard of any particular problems with road conditions on the Ho Chi Minh Road recently. If there are any landslides they’re most likely to be on the Western Ho Chi Minh Road between Phong Nha and Khe Sanh, so it’s a good idea to ask in Phong Nha about road conditions before you start that leg of the journey. Other than that, just bear in mind that this time of year is the winter in northern Vietnam, so anywhere between Hanoi and Hue could be surprisingly cold and grey. Thanks Tom. Yes I have been checking the forecast and I didn’t realise how cool it might be, so we will certainly be keeping warm. Didn’t realise it would be grey though. Hopefully the sunshine and brightness is over us for the most of our journey. Can you highlight exactly where I say ‘Don’t go east on 9 go west on 9’? I don’t recall writing that anywhere. I don’t have any specific information about those border crossings, but as far as I know they are open and you can get Laos visas at the border. However, I would check first. Maybe try searching the Vietnam Back Roads Facebook group for some more information. Thank you so much for sharing your motorbike travels in Vietnam. It has made planning very easy. That being said I have one question. We are flying into Hanoi and planning on buying motorbikes and heading south through the central part. We are hoping to actually skip the northern section. Therefore, are there trains that allow motorbikes from Hanoi to Pho Chau where we want to start or will there be motorbikes for sale in Pho Chau? If its a no to both than I guess we’ll have to start in Hanoi and travel down south to Prao where we plan to head east to Hoi An. I’m afraid it is a ‘no’ to both. However, you can send your bike on the train from Hanoi to Vinh and then head inland to meet the Ho Chi Minh Road at Pho Chau. But remember that your bike will usually take at least 2 days to arrive at its destination. More about that here. I just came back from one month trip from Bình Thạnh to Hà Giang (Mã Pí Lèng Pass) via QL14,QL15, QL6, QL12(Sìn Hồ),QL 4D (Sapa), 4C (Mường Khương) then went back to HCM city via QL34, QL 4A, 4B, QL 10 and QL1. The Phan Rang-Cà Ná section(đường ven biển Ninh Thuận) has stunning scenic where the rocks meet the ocean. Your guides are absolutely helpful. There is no need for gas reserve for the Khe Sanh- Phong Nha section now because there are 3 more full services gas stations spacing out evenly along the route. And there are more settlement of people also! So no more “vắng người”. Great to hear you enjoyed your road trip. I’m just on my way back to Saigon too after a 2 month trip. Thanks for the updates about the gas stations – good to know there’s plenty on that route now. Glad you enjoyed the ride and thanks for the updates. I just arrived in a loui tonight and the same thing happened. Tried all the larger places and they all said no and they didn’t look busy at all. A small place behind the petrol station finally said yes but wanted to charge 250k. I got her down to 200k but it was really weird. That’s very strange. I’ll be there in a few weeks so I’ll see what happens. What a wealth of info on your site. I booked a last minute 6 week trip and am planning on buying a bike to ride up the country – may go for your classic route. Any notes on proper mapping for the routes? Is it easier than I think as far as the logistics go? Also, as far as gear, should I bother bringing a leather (old style motorcycle jacket) with me? And you think I’d be okay with some high-top sneakers for the trek? Having a tough time sorting out my gear. I have so many other questions, but I will try and find the answers rather than having you do my work! I leave tomorrow, pretty excited and hopefully prepared. For mapping, you can use Google Maps, openstreetmap, or maps.me using data on your phone – buy a local sim card when you get to Vietnam. Google Maps doesn’t work offline, but maps.me does. You can follow my route by exporting any of my route maps from google to maps.me. It can get cold in the highlands and mountains so make sure you have at least one set of cold-ish weather clothing. Also, get rain gear when you arrive, and a big bin bag to wrap your luggage in when it rains. Sneakers are fine for trekking. Rather than buying a bike randomly, it’s a much better, safer, reliable, and more convenient idea to get your bike from one of the reputable bike rental places. Rent a Bike Vietam, Tigit Motorbikes, Style Motorbikes, Flamingo, and Dragon Bikes all offer good quality, reliable bikes, and when you finish, you can give them back in Hanoi. Hello! I plan to ride solo from Hanoi to HCM in about a week. Would you recommend using your guide backwards to help me with this route? Or are there any other websites/guides out there travelling north-south that you would recommend? Thanks! Yes, you can use this guide backwards. But please note that one week to complete this route is not very long: the total distance is 1,880km, so you will be riding at least 200km each day. Just wanted to say Thanks!! Your guide was amazing really helpful to pre-load the google maps into our phone and set out on the road. We just finished 2 days ago and was incredible! Just a couple notes for updates. The construction to Cam Thuy is pretty much done now so it was only around 20 minutes of construction so really not a bad road to pass through. There is also a new hotel in Khe Sanh called the Green Hotel. In A Louie though we had a unique experience where every single hotel or guesthouse was full and didn’t have a room available for us around 330 pm, even guesthouses that didn’t look busy at all, so at 5 pm we had to drive all the way to Hue to get a room for the night (we were worried about the same thing happening on the way to Khe Sanh. It was very odd, almost like the hotels didn’t want us to stay with them. Otherwise, turned out well because we traveled the Hai Van Pass loop as well. Great to hear you enjoyed your road trip. Thanks for the updates – that’s really useful for me and other readers. Strange about the guest houses – I have heard of similar situations, but it’s very rare indeed. Just completed the Khe Sanh to Phong Nha section yesterday. Amazing ride but it rained for 7 hours out of 8. Still it was qui te a nice atmosphere riding alone in the mist and rain! Just wanted to point out that there is now a gas station around the town of Long Ky ( if i recall the name correctly ). Did not stop myself but it seemed open with a car and motorbike at the pumps. Might be useful for others. I think i will continue on the hcm road to Hanoï as i have heard Ninh Binh was quite touristy and a bit disappointing. What is your view ob this? Thanks again for your super useful information! Thanks for pointing that out – I think that’s probably the gas station in Long Son (also marked Troung Son) that I mention in Section 5 of this guide. 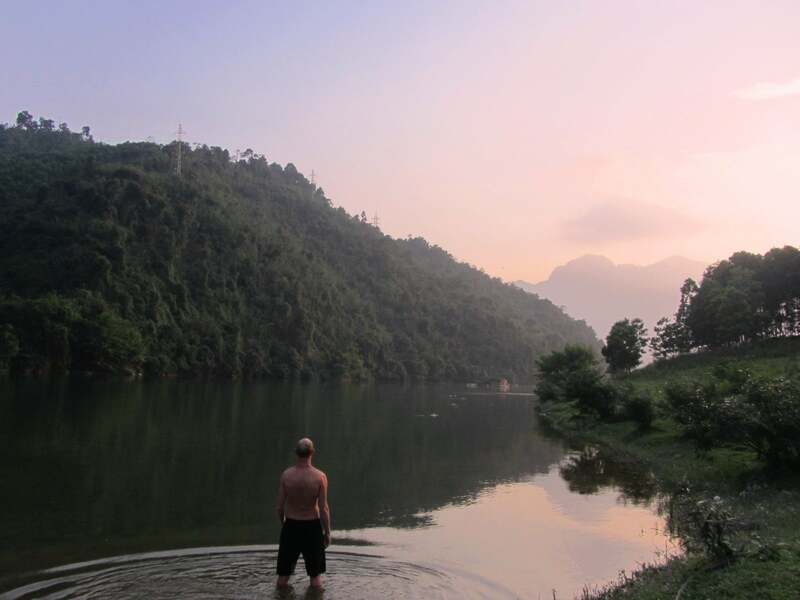 Yes, I agree about Ninh Binh – the landscape is lovely but it’s ruined by mass tourism and mass industry. The limestone landscape on the Ho Chi Minh Road and Pu Luong Nature Reserve is just as nice but nowhere near as touristy. thanks again for the great advice i will follow it. Tang Ky, a bit earlier on the road. It is this one i wa refering too. Sorry for the mispell ! first of all thank you so much for your incredible blog and website. Never have I ever seen something so helpful for planing my journeys. I`ve got one questions left though, since I don`t have too much time and still would prefer not to rush I decided to start my trip from Hoi An, jump on to the Classic Route and go to Hanoi from there. Since I don`t want to miss out on the central highlands completely I thought that I should make a short trip towards the direction of Kon Tum first, just wondering how far. Is it more the way itself that is worth seeing or is it the place Kon Tum itself? Thanks. It’s great to hear that my site has be helpful to you while planning your trip. I just wanted to give a little shout out to Vietnam phuot homestay in Kon Tum. I spent one night at the recommendation and then found this place and it was ridiculously hospitable and sweet. Great food and free tours around kon tum included. I would recommend anyone travelling through to go there. Thanks for the recommendation – it looks like a great little place. First of all we just want to say a huge THANK YOU for your blog, we have been following your Classic route and it has been absolutely fantastic and has made our trip unforgettable and the best experience of our travels so far! Just a quick question for you if that’s ok, we are heading to Ha Long Bay rather than Hanoi, and are unfortunately running out of days, where would you suggest we leave the Ho Chi Minh road and head across to Ha Long Bay? We are currently in Phong Nha and heading to Pho Chau now. We really only have 2 days to get to Ha Long Bay after today. Great to hear that you’re enjoying your road trip. Unfortunately, there’s no easy option for riding across from the Ho Chi Minh Road to Hai Phong (for Ha Long Bay). But you could try turning east from Lam Son. Bear in mind that some of these roads are Red River Delta lanes that can get quite beaten up by all the trucks. But once you get nearer the coast the roads should get better – although the traffic will probably still be heavy. Another option is to turn east at Yen Lac (further up the Ho Chi Minh Road) and go via Ninh Binh. Hi Tom, me and my girlfriend are riding from Saigon to Hanoi (possibly Sapa if there’s time) and have been using your guide and found it amazingly helpful. We did our first stop in Mui Ne and used your Saigon escape route guid to get there and loved the coastal road, then we did the route up to De Lat where we are know. Im looking at your Ho Chi Minh route guide for the next bit as we want to go to Buon Ma Thuot then Kon Tum but after this we would like to head to Hoi An. Do you think its possible to do the route from Kon Tum to Hoi An in a day and what route should we take? If its not possible where would you recommend we stay for a night? Have you considered taking the Truong Son Dong Road between Dalat, Buon Ma Thuot, Kon Tun instead? It’s a fabulous ride, scenic, good roads, quiet – all in all a lot nicer than taking that particular section of the Ho Chi Minh Road. Just a thought, but take a look at this guide if you’re interested. You probably could ride Kon Tum to Hoi An in one day if you started early in the morning and rode all day, but it’s a much better idea to take two days instead. Take the Ho Chi Minh Road from Kon Tum to Kham Duc and stay there a night (it’s a good ride). Then stay on the Ho Chi Minh Road from Kham Duc to Thanh My (another good ride) and turn right (due east) on road QL14B to Danang/Hoi An. (An alternative route is to take road 14E east from Kham Duc down to Hoi An). Next summer I want to do the north east maybe approaching from Kunming. Thanks. I’m happy to hear you had a good time on your bicycle trip. Thank you so much! This webpage has been our Vietnam motorbiking bible over the period of one month, and perhaps another few weeks if we’re going to do the north loops. You’ve helped us have the time of our lives! Thanks! It’s wonderful to hear that you’re having such a good time in Vietnam and that my guides have helped you too. I hope you do stay for another month and continue to enjoy your road trip in the north. I read that the 100km stretch from Phong Nha to Pheo (Tan Ap) is said to be the most scenic by some people. I’m planning to go as far as Phong Nha by motorbike to explore the caves for a day or two from Hue via Khe San, with a overnight stop at Long Son. After Phong Nha, I’ll be taking the same route back to Hue as I will have to reach Da Nang eventually for my flight back (will break the route over a couple of days). Say if i got time on my hand, I wonder if it will be worth the effort to continue riding from Phong Nha to Pheo (Tan Ap) and then riding back down the same route to Phong Nha- Hue- Da Nang (over a couple of days). Thus, do you think that the extra 100km will be worth it and if there are any hostels in Tan Ap to stay the night? Bear in mind that if you are planning on riding this route during the Tet Lunar New Year holidays, then Phong Nha and the roads to the caves may be extremely busy. But any other time of year it should be very quiet. My friend and I just did the Ho Chi Minh Road. It was fabulous! Even if most of the time the weather was foggy and/or rainy, it gave some kind of mysticism to the scenery. And all of this thanks to you. Really a great job this website. Plus the historical and cultural insights are very interesting. My partner and I are planning a trip soon that I’ve mapped out myself referencing your maps and some others I’ve come across. As far as accommodation goes it’s pretty easy to find places online and most of the bigger cities seem loaded with hotels and guesthouses but I’m just wondering if there are many guesthouses or hotels in Kham Duc or close by as we’re planning to ride from Kon Tum to around there in a day and the only info I can find for places to stay are the two you’ve mentioned in Kham Duc. Thanks for all the hard work/riding! Yes, there’s plenty of accommodation between Kon Tum and Kham Duc. There are hotels and guesthouses in Dak To, Ngoc Hoi and or Dak Glei, which is about half way between Kon Tum and Kham Duc (I mention the details in this section of my guide). In Kham Duc there are around half a dozen places to stay, including the ones I mention in my guide, so you shouldn’t have any problem finding a room, unless it’s a public holiday. Throughout this Ho Chi Minh Road guide, and all my Road Trip guides, I mention places to stay along the way, including contact details. Great site, great inspiration and source of joy reading all these people’s experiences. And you clearly are a culprit there. Congratulations! I am doing your Beach Bum Route on bicycle between Nov 25 and Dec 18- well, that’s the plan. I wonder what’s your thought- would it be too cold for Sapa circuit; should we get back to Hanoi by train/bus or could we simply join HCM Road somewhere; is Duc Tuan still the only place to stay at Western HCM Road; are we set for wet central part of VTNM and just cheat by taking bikes on the bus, or we have to play it by ear on daily basis. It will probably by cold in Sapa at that time of year, so it just depends whether you don’t mind a bit of chill while riding your bike 🙂 Also, bear in mind that 3 weeks is not that long to ride the length of Vietnam by bicycle, so you might be pushed for time if you do Sapa as well. Going back to Hanoi by train would be fine. Or you could go back via Mai Chau and then join the Ho Chi Minh Road at Cam Thuy or Ngoc Lac instead. Yes, Duc Tuan is still the only place to stay on the Western Ho Chi Minh Road, read my full review of this place here. It probably will be wet in central Vietnam, but this is just the chance you take at that time of year. Yes, you can just play it by ear – if it’s raining all the time, just put your bicycle on a bus. I just wanted to thank you. I did the south to north Vietnam trip on crappy yet incredible Honda Wins with three Dutch friends, and due to the discovery of your website in Hue, our trip has transformed from rememberable to unforgettable. The moment we left the highway and turned into the mainland (following your HCM-road directions) it has become an even more incredible experience. And for the icing on the cake, the ”extreme northern loupe” could possibly be the most beautiful place in the world. Thank you so much for your awesome website and your help. Thanks! It’s really great to hear that you had such a wonderful trip and that my website helped. I hope you’ll always remember your road trip in Vietnam. I am a female traveling alone by motorbike on the way to Hanoi and am looking to follow your guide up the rest of the way. Would you say that I would be safe in these rural areas by myself? I would ideally like to meet people to ride with but haven’t found anyone heading my direction yet. Thoughts on female solo travel this route? Yes, I would say it’s safe for a solo female traveller riding on this route. Vietnam is still a very safe country in which to travel. But, of course, things do happen. Take all the normal precautions you would when travelling anywhere else in the world and I’m sure you’ll be fine. If you want to find other people who might be riding that stretch of road, try posting on the Vietnam Back-Roads Facebook page. I was wondering if there was a group on facebook! Thank you so much Tom! I’m riding this route aswell. I’m starting tomorrow on the 21st of August. If you don’t want to ride on your own feel free to join me for a part of the route until you feel comfortable. If you need my mail ask Tom he already has it. I emailed you Fabian thanks! I’m planning on doing this trip in early November this year. I was thinking about what kind of motorbike to buy. Probably an automatic one. I have a manual motorbike so shifting is not an issue….but why would I bother? Is the Honda Nuovo a good choice? How much did it break down and what is the oil change interval? Yes, an automatic like the Yamaha Nouvo or a semi-automatic like the Honda Wave is all you need. They are both reliable, easily repaired, easy to ride etc. Personally, I use a Yamaha Nouvo, which I love, but many ‘bikey’ people disagree. Check out Tigit Motorbikes for buying your bike and they also have good information on their website about which bike to choose (there’s a link to Tigit Motorbikes in the sidebar of this page and above this comment section). This website has been so useful when planning my trip from HCM to Hanoi. I’m now in Phong Nha after an epic ride from Khe Sahn which was a highlight of the trip. Long Son was a great little stop off and if I head back there I think I will definitely spend the night so I have more time to relax, swim and enjoy the beautiful countryside. There is now a petrol station being built which was about half finished which is good to know for the future. I now need to head to Hanoi and was looking at going via Ninh Binh. I’m looking at going to Pho Chau and then Dan Luc. As my friend is arriving in the next few days I was thinking about skipping Ninh Binh for now and going straight up the HCM from Dan Luc to Hanoi. Do you know if this would be a good option. I’m basically looking to get to Hanoi, avoiding any horrible highways and traffic. Any recommendations would be great ! Thanks for the useful update about the gas station under construction in Long Son – that’s great news! Yes, taking the Ho Chi Minh Road from Pho Chau all the way up to Hoa Lac and then turning east on the Thang Long Highway into Hanoi is the best way to approach the capital without encountering too much traffic (as described in Section 8 of this guide). However, the last 1.5 hours is always a little bit busy and polluted – that’s just the way it is. There is a good hotel in Yen Cat named Dai Lam Hotel. It is just as you’re passing out of Yen Cat on your way north. To get in Yen Cat you exit off HCMH onto a parallel road that then comes back onto the highway. Where it reconnects is where the hotel is located. It also has a gas station in front of it. The cost is 250000. They were grilling duck a couple doors down and that was actually a good dinner. I saw three other hotels in town but they were all inferior to this one. Yes, there are a few hotels in Yen Cat. I also like the one on next to the gas station on the edge of town that you mention. That’s a really helpful update for me and I’m sure any other readers who are following this guide on the Ho Chi Minh Road. Thanks for this very comprehensive tour information, it was very helpfull to plan my next cycling trip. The pictures are great too, nice job. Thanks, Peter. Glad you enjoyed it. Honestly I’m a little bit concerned about the overnight thing. Do you find possibilities for sleeping quite often on the Ho chi Minh road? Which particular part of this trip are you concerned about overnight stops? In the above guide I’ve included the names, prices, contact numbers and mapped accommodation on the entire Ho Chi Minh Road. Unless you are travelling during a national holiday you don’t need to book rooms in advance: just turn up on the day and get a room. Thanks, it’s great to hear that you enjoyed the ride and that my guide was useful to you. Good luck selling your bike! Great guide, but I was wondering how dangerous this trip would be for someone that hasn’t driven a bike before. I’ve heard some horror stories about people getting run off roads by trucks etc. Could I get your opinion on this? You should always be very careful when riding a motorbike on Vietnam’s roads. In the context of the whole country, the Ho Chi Minh Road is relatively safe, because traffic is much lighter than on other major roads in Vietnam. Road conditions are good for most of the journey, but some sections are extremely mountainous and occasional stretches have trucks on them. Ultimately, you’ll have to decide for yourself if you feel comfortable enough on a motorbike to ride this route. The more time you have the better, as this means you will not be rushing. Thanks for the great guide! We just wrapped up a tremendous trip. We used your guide most every day from Ho Chi Minh to Hanoi, now we just have to sell it! If anyone’s interested in a reliable bike, we rode a Honda Win which gave us very little trouble. Great to hear you had such a good trip. You might have more success finding a buyer for your bike at some of the more popular hostels in Hanoi or try posting it on the Hanoi Expats Facebook page. I love this guide and I’m going to start the Ho Chi Minh road on June 15 with Yamaha from Tigit. This is a minor suggestion, a quibble at best, but I decided to go from North to South and to do a reverse route would be easier on the brain. Again just a minor suggestion and I’ll make do with how your excellent guide is set up. Good to hear you’ll be riding the Ho Chi Minh Road. As this is a very long guide (10,000 words) it would take way too much time to write another version going from north to south. As it is, you shouldn’t have too much difficulty in following this guide in reverse. Thanks for all of this valuable information. 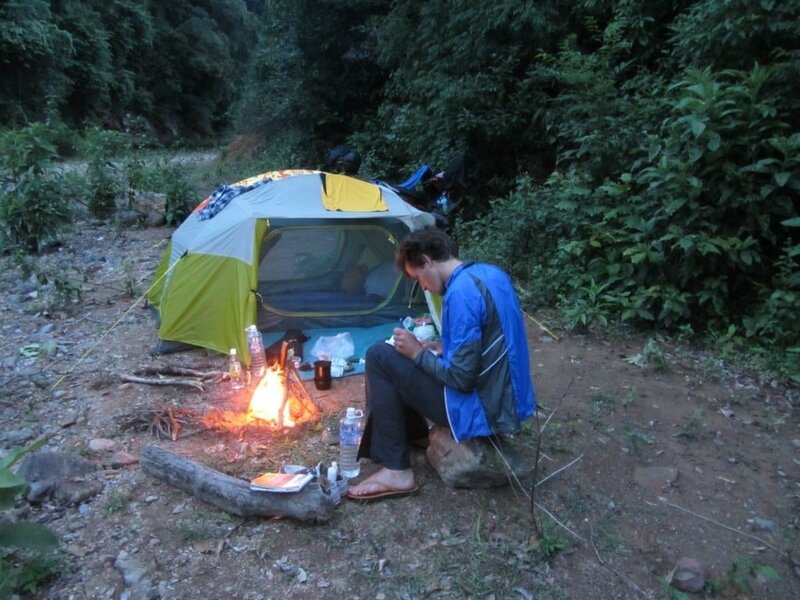 I’ve read through your camping articles (Dalat and Ocean Road) and your comments on this article. I’m taking my eno hammock and I’m wondering if there are many places to camp in a hammock along this section of the road. I saw your response to one message about being hidden while being careful for unexploded mines. How would you recommend picking a spot to set up a hammock? I plan on staying in Khe Sanh, Nha Phuong (here, I’ll probably stay at Easy Tiger or one of the other hostels) and Pho Chau. Also, on a related note, is there opportunity for hammock camping in Ha Giang? Firstly, I’m just in the process of fully updating and expanding this guide to the Ho Chi Minh Road right now. It should be finished in a couple of days, so look out for that or subscribe to my posts here if you’d like to get an email notification when it’s published. There are plenty of opportunities to hammock camp on the Western Ho Chi Minh Road – the same rules still apply as the how to choose your spot. Trees near rivers are always nice places to be and there are lots of spots like that on this section of road. Also, as mentioned in the comments and as will be included in my updated guide, there is now a hotel halfway between Khe Sanh and Phong Nha, in a little village called Long Son. Yes, in Ha Giang too you’ll find spots to put up your hammock. You’ll kind of get a feel for places after a few days on the road, if you know what I mean. I hope this helps and that you get the chance to sleep out a lot. Tom, I just did a trip to Phong Nha and this blog helped so much! The map you put together was on point. I thought that I should make my own but then I realized that you had covered everything and I would have very little to add. Thanks for making this a smooth trip man! 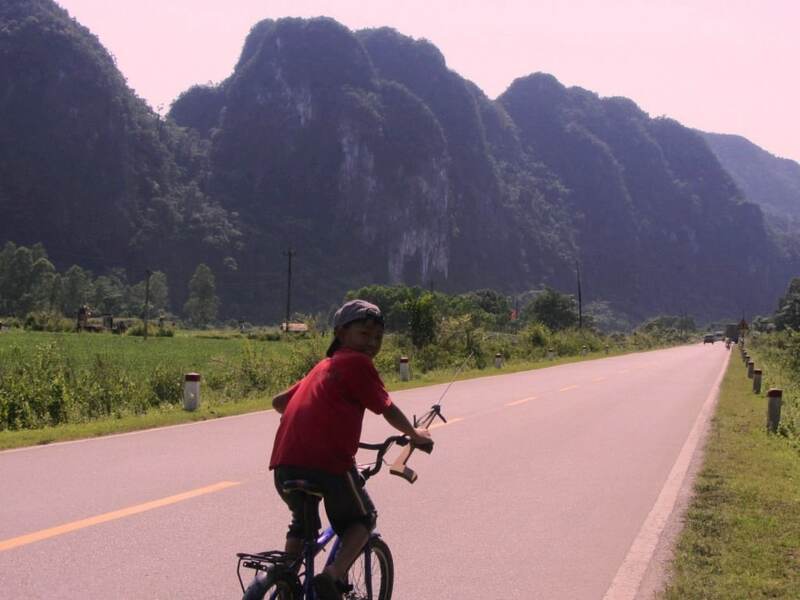 Great to hear you enjoyed Phong Nha and the ride there. I hope the rest of your travels in Vietnam are just as enjoyable. I’m back with a road update on the HMC Road, beginning at Phong Nha and heading South. The first 100 km from Phong Nha to Long Son (where the hotel is that got recommended in the comments), the road was beautiful but there is a bit of construction going on at the moment. There’s lots of gravel in the corners and the occasional stone pile which you have to avoid. The road itself is still in top shape and is entirely rideable, but the constructions slowed us down a bit. This should be kept in mind if anyone wants to ride the entire 240 km in one day. The rest was in pristine shape and we had an amazing time! Unfortunately, the weather wasn’t playing along, so we got wet a few times. Now we are relaxing in Kon Tum for a bit before we’re heading to the coast. Thanks for the update. Sounds like a good ride, despite the weather! 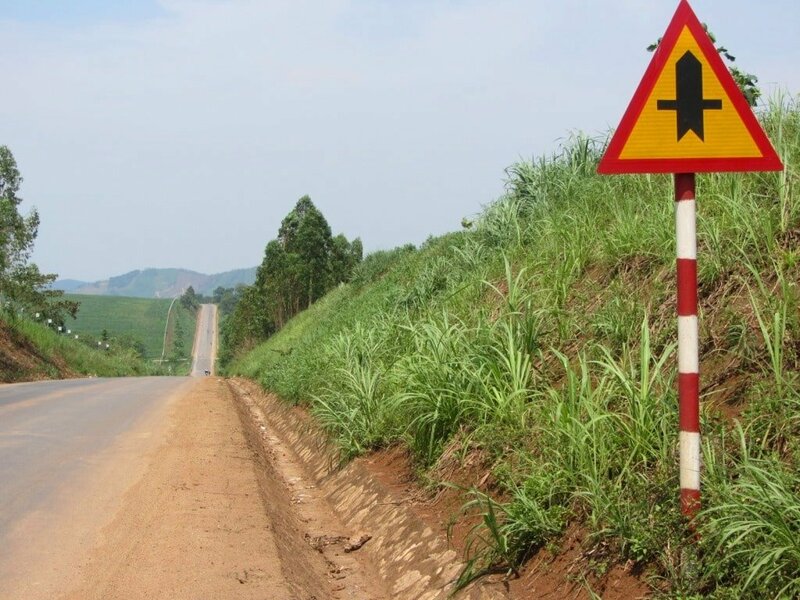 If you’re taking Road QL24 from Kon Tum down to the coast near Quang Ngai bear in mind that a few readers have mentioned some construction on this route recently. No one has reported that it’s not passable, just expect some roadworks. Checking in from Hue this time after successfully surviving the Northeast Loop 🙂 Still a big fan of your work! This time, I have a question: We want to drive to Vinh Moc from Hue and visit the tunnel systems. From there, I now pieced together a route taking us inland over QL15 East. Here, we meet QL15 west on a crossroads and continue south to Khe Sanh. It’s a 176km section, which seems to be doable. Or are we missing some vital information, like a horribly bad road, constructions or other obstacles? We don’t want to miss out on your favourite stretch of the HCMR, but the question is: Is this part also worth it? Would you suggest a better route? Should we go further North and join the section there to see the highlights? If you have some input for us, we’d be very grateful! Firstly, from Hue to Vinh Moc Tunnels you can take small, scenic back-roads along the coast all the way. Zoom in close to the relevant section of this map to see the route. Secondly, the route you have from Vinh Moc Tunnels to the Western Ho Chi Minh Road and Khe Sanh is good – there are some potholes on the road linking QL15 (the Eastern Ho Chi Minh Road) and the Western Ho Chi Minh Road but nothing serious – at least last time I rode it. So that route is fine. 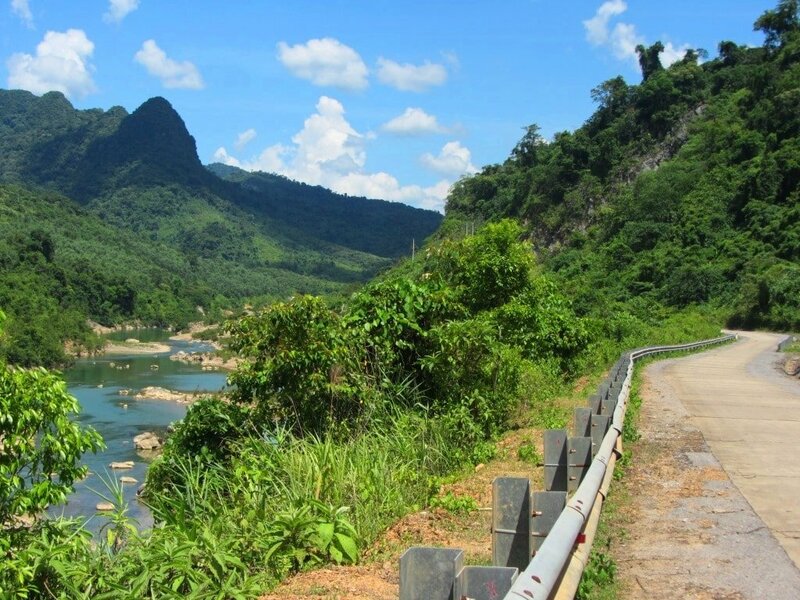 However, the section of the Western Ho Chi Minh Road from Xuan Son (Phong Nha) to the intersection where you plan on joining the road is one of the most scenic rides in Vietnam. So, if you have the time and energy, then yes it is worth taking the Eastern Ho Chi Minh Road north (QL15) all the way to Xuan Son and then joining the Western Ho Chi Minh Road from there. (QL15 is a relatively easy and flat ride so it’s not such a big deal to ride it). I hope this helps you to make your decision. Wait! Sorry, I misread your map. There have been reports of heavy construction on one or both of the roads connecting the Eastern and Western Ho Chi Minh Roads at that intersection. So I think it’s probably best to avoid that and continue on the Eastern Ho Chi Minh Road all the way to Xuan Son then join the Western Ho Chi Minh Road south to Khe Sanh. You’ll have to add a couple of days to your itinerary but you will see fantastic landscape and you will have the peace of mind that you won’t be travelling those roads under heavy construction. Whichever route you choose, please let me know how it goes. Your remark on the Eastern QL15 is encouraging. We don’t want to ride two massive mountain sections in two days but if you say that the Eastern route is flat, it helps calculating the effort. I’m really keen on doing this section, but what could we leave out in the South for it? If you had to name the first low- to midrange beach spot that comes to your mind where there’s some waves to play with – which is it? Also, can we buy you a beer somewhere for all your help? You can leave out the Ho Chi Minh Road from Kon Tum south. And you could leave out the coast from Hoi An south to Quy Nhon. Also there’s no real need to go to Dalat considering all the amazing highland scenery you will have already seen in north and central Vietnam. The best coastal roads are from Nha Trang all the way south to Saigon – all on excellent (mostly) new roads with great ocean views and plenty of accommodation in all price categories (only a total of 50km on Highway 1) – see this map. Waves are difficult to predict. Mui Ne almost always has them from 12noon onwards. Long Beach, just south of Nha Trang is famous for some of the best surf in Vietnam. Cam Ranh Bay is superb coastal scenery but no surf. To be honest my Camping Guide to the Ocean Road is a great way to experience the southern coast – I’ve just done it again with with close friends from the UK last week and it was fabulous. We are in Hoi An going to Da Nang after. Would you recommend taking the Hai Van pass to Hue then over to HCM road or straight to HCMR from Da Nang and head north from there. Good question. Personally I prefer going straight for the HCM Road from Hoi An. But both routes are good. It really depends on whether you feel like some ocean scenery or some mountains and jungle. If you choose the Hai Van Pass then make sure you take the coast road after the pass to Hue which I’ve outlined here. I hope you enjoy whichever of the routes you choose. Great site Tom. I’m using it a lot for a Saigon-Hue trip I am contemplating in June. I’m wondering how many days one would need for following QL1 out of Saigon, turning inland south of Quang Nga onto QL24 ito catch the HCM Road at Kon Tum, taking that to QL 49 into Hue? It’s about 1400km, so I’m figuring 7-9 days with some leisurely stops. If anyone has ridden this route, any advice would be appreciated. If there’s a more scenic/adventurous route using QL 1 and the HCM Rd, would love to hear about it. And is the fastest way back from Hue on a train? Unsre if I will load bike on train or try to organise a drop-off in Hue, if that is even possible. Definitely don’t take Highway 1 all the way from Saigon to Quang Ngai – there’s a much better route along the coast. Followg the route map from Saigon to Nha Tran in this guide. Then from Nha Trang to Quang Ngai you will have to go on Highway 1 for certain sections, but there are still good, smaller, coast roads – for example, from Dai Lanh Beach to Vung Ro Bay and then to Quy Nhon, and also from Quy Nhon north to Tam Quan. To follow this route zoom in on the relevant sections of this route map – it can be a bit difficult to follow, but it is worth it. Both QL24 and QL49 are scenic roads but there are reports of some road works on them, so be prepared for a slower ride time. Yes, 7-10 days is a decent amount of time to have for this road tip – although, as always, the more time you have the better. Yes, you can put your bike on the train from Hue back to Saigon. Or maybe Tigit Motorbikes or Flamingo Travel can arrange a drop-off. It certainly does help, Tom. Thx once again. Last question..er, for now…any contacts in Da Nang for renting reliable touring or dirt bikes? Yes, sure – try Rent a Bike Vietnam, they have an office in Danang: you can find a link to them in the right sidebar and bottom of this page. Have a little unusual question this morning. I am headed south from Pleiku returning to Saigon as I have to return to the US do to my mother falling extremely ill. I will make Boun Ma Thout this evening and wondered if you know what my fastest route south from there? Some friends last week told me ql27 headed south toward Da Lat was nice but very slow and south of there I have no idea on any of the roads. Very sorry to hear about your mother. For the fastest way back to Saigon from Buon Ma Thuot take the Ho Chi Minh Road (Highway 14) all the way south to Thu Dau Mot (just outside of Saigon). The journey is about 400km and can be ridden in one day if you start early in the morning. An alternative is to take Highway 26 from Buon Ma Thuot to Ninh Hoa and then take a train from Nha Trang back to Saigon. I thought 14 looked like the most direct route but sometimes these roads can fool you in the time department. We all get old and there is not much we can do about it. This is the first time in 33 years of travel she has ever requested me. So you do what you need to do. Ps: we had driven past the mountain pass that is north of Khe Sanh, and made that right turn about 10km after exiting the pass, if helps locate our turn, and road construction location. I just drove from Khe Sanh to Phong Nha but due to steady rain we turned right at a fork on a “shortcut” about 70-80km after Khe Sanh, on a road that was getting us to Ho Chi Minh road east. It turns out this is a major construction sites over 10km long, with bridges being built, and we had to ride through rivers and very slippery mud, taking us 3hrs to get to the Eastern portion of the HCM road. Don’t make the same mistake, don’t take that right turn!! And if anyone knows which road I ended up being on that has this massive construction linking the east and west Ho Chi Minh road above Khe Sanh, please let me know. I think you must have taken the road from Tang Ky. Someone has commented before that this road is undergoing repairs. I hope the weather improves soon and that you get to enjoy some good roads in better conditions. I love your blog. It not only gives travellers useful tips but also shows how beautiful Vietnam is. As a Vietnamese, I would like to thank you so much for that. 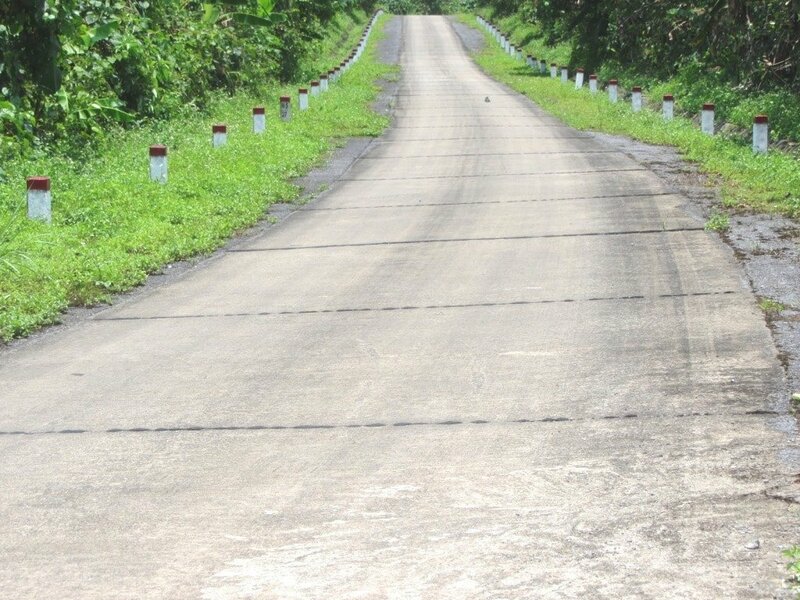 I would like to ask you along HCM road (from Kon Tum to Phố Châu) which section (which day) is the most beautiful in your opinion. Because I dont have much time to go all the route you did, I want to choose the best section to conquer. I have 2-3 days only. How about West HCM road from khe sanh to Phong nha? Is it the best? Thanks, it’s great to hear you like my blog. Yes, you’re absolutely right: if you only do one section of the Ho Chi Minh Road then it should definitely be the western branch from Khe Sanh to Phong Nha. First of all I wanted to thank you again for superb guides that helped me plan my trip. So far it was awesome! I did the costal road and camped in several places and now I’m doing HCM road and Golden Loop. Great to hear you’re enjoying your Vietnam road trip. Yes, you’re right about Tet. The Ho Chi Minh Road has relatively few nhà nghỉ anyway so you might find that some of them (in the more remote areas) are closed for a few days over the Lunar New Year. But certainly not all of them, because lots of Vietnamese travel at this time of year (making long journeys) so many guesthouses stay open to cater to them. Awesome trip, I’m defintly thinking of doing the same trip as you made. I actually have around 18/19 days. Im with a friend were quite young and don’t mind driving like 250 km a day. would it be possible for us to that between the time we have? The setting of our vacation will be a roadtrip/party/holiday chilling isn’t that important for us! i would really appreciate your tips and comment! Yes, sure 18/19 days is enough time to ride this route. In general, it’s a good idea to start out early in the day (just after breakfast) so that you have enough time to enjoy the ride and stop on the way. Some long days of driving (200-300km) are fine too, especially on the Ho Chi Minh Road because traffic is light and the road condition is good. First of all I want to thank you for your reply. So the amount of days I have should be enough, are there also some places with tourists so that we can have a little party and mingle with the other backpackers? And were thinking of renting a bike.. is it also possible to rent it in Hanoi and dropping it off in Ho Chi Minh ( or the other way around). And where do you think that we should start our trip Hanoi or Ho Chi Minh. If we drive 200/300 km’s a day how many actual driving days would that be? And is it true that we can only rent 50cc bikes due the regulations? because is went to the site that is shown on this page and that company starts with 110 cc bikes. Im sorry for al my questions.. I know that it seems that i didnt do much of searching and looking up stuff, but in the contrary.. the issue is i attach more value to experiences of other people than i do to websites. You can meet and drink and party with other backpackers in plenty of places along the way: Son Trach (also known as Xuan Son and Phong Nha) is a small place but the growing backpacker vibe in some of the hostels means you can have a fun night drinking and chatting there. You can drop down off the Ho Chi Minh Road to Hue or Hoi An easily for a night out too. Then Nha Trang is probably the best place for nightlife in Vietnam (after Saigon, of course). Yes, renting in Hanoi and dropping the bike back in Saigon (or the other way around) is possible. Try Rent a Bike Vietnam (the one shown on this page) or Flamingo Travel. With long days on the road of between 200-300km per day you’re looking at around 10-14 days of driving – that is assuming you ride something similar to the Scenic Route, which is between 2,500-3,000km in total. Officially you can only ride a 50cc bike if you do not have a local drivers’ license, but in reality hardly anyone does. Standard bikes are 110-125cc and that is what the vast majority of riders use. If you get stopped by the police you may have to pay a standard $10 fine. But your rental company will give you more information about this, including a number to call while you’re on the road for assistance if you get stopped. I can not even express my gratitude in finding you. Your amazing adventure has completely changed my plans around. I have been doing research for weeks and I was starting to get a little sad about my trip. Everything seemed based around guided tours and that’s just not my thing. Also the throngs of pictures with tourest everwhere also isnt my thing (even though I am one) so finally I find your site and my spirits are renewed. I am beyond excited for the ride ahead. Not sure though if I can make it. I have exactly 23 days in Vietnam from April 22 to May 16th starting in Saigon. I want to make it over to Ankor wat for sure. I will probably do this first. 1st question have you taken this trip on bike? Is it okay to cross border on rented scooter or should I just take the bus? I also want to travel up north to Hanoi. I would like to follow your route all the way. I would though like to just fly back to Saigon so I have a little time to chill and not feel rushed. Is this possible? Just renting a bike from Saigon and leaving it in Hanoi. I am.going to check that link to see if they would deliver it that far. I am an experienced rider and not afraid to travel alone Vietnam so no worries there. Vietnam seems safer then India and I did that by myself. I would have to do that whole trek in under 2 weeks. Is that even possible? Wish I saw you before I bought my ticket I would stay longer. Thank you so much for the insperation, the writing, the vidoes. I cant wait to read all your other articles. Yes, it’s definitely possible to ride from Saigon to Hanoi in the time you have, and it is also possible to rent a bike from Saigon and drop it off in Hanoi. However, I suggest either taking the bus or flying (at least one way) between Saigon and Angkor. This way you will have more time to do the ride. Two weeks is OK, but between 2 and 3 weeks is much, much better. It will give you the time to really enjoy the riding, the scenery, the people, the food etc. Two weeks – especially if you’re travelling the Scenic Route (which is much better than taking Highway 1) – is just a little bit too rushed, and it will not leave you much time to ‘chill’ at all. Driving the Ho Chi Minh Highway. So many of us Ho Chi Miners use your site as a bible for the ride. I was hoping you could add the following info about the route between Khe Sanh to Phong Nha. There is a village a bit north of Tan Ky close to the valley of rice fields where there is petrol and a hotel called Duc Tuan Hotel – 0949 522 331. Thank you for your wonderful site!!! Thanks for the valuable update – I’m sure other ‘Ho Chi Miners’ will benefit for this information. Enjoy the rest of your ride! Been following your web site for awhile and must say it is of great value and thank you for your work. I am flying into Ho Chi Minh on the 30 th of Jan for 10 weeks. Plan on buying a bike in the south and slowly working north trying to catch the last couple weeks of March in the far north depending on weather.. Thanks! With 10 weeks you should have a great time! Yes, it’s best to leave the north to last at that time of year – even central areas, like Hue, might be pretty bleak during those months. Thanks again. I’ve read the posts you mention before. Maybe I’ll try camping around Dalat too, being woken up by buffalo might be shocking experience though 😉 When I was asking about safety, leaving tent and chances of charge electronics I had these designated camping areas from your guide in mind – sorry for not being specific. But from you say it should be OK there. Regards charging electronic stuff – you’re never too far from a local cafe where you can plug your equipment in for an hour while you drink your coffee. Remember to bring a multiple adapter so that you can charge all your stuff at the same time! Thanks for super useful and inspiring guide! I’m heading to Vietnam in the beginning of January planning to ride from HCMC to Hanoi and can’t imagine deciding to do that without your guide. My plan is to buy a bike & tent and take Coastal Road up to Quy Nhon and than Ho Chi Minh Road. I’m traveling solo and have more than five week’s time on my hands for this trip. I have some questions and will appreciate your (or other riders’) reply. 1. I definitely can’t say I’m experienced driver. I’ve only ridden through some parts of the Ma Hong Son Loop in northern Thailand and in Chiang Mai. Is it gonna be very hard to get out of Saigon and get to the coast? 2. I’ll be doing my trip in January/February and I’m not sure about the weather. From what I know this part of year is okay when it comes to the south. Is it also true that central highlands and north will be dry but chilly? Will it be super cold in the night if I’ll be forced to camp somewhere there being unable to find a guesthouse in the evening or simply deciding that I want to spend the night in the tent? 3. I don’t want to miss any part of HCM Road but still want to see some places on the coast, Hoi An and Hue to name a few. Does it make sense to ride there back and forth? 5 weeks is a good chunk of time to have to do a south to north motorbike trip. Because you have so much time I don’t think you’re relative lack of riding experience should be a problem. Yes, getting out of Saigon is not that fun. But if you take the ‘back way’ out of the city (using the Cat Lai ferry and cutting through Nhon Trach industrial estate before joining highway 51 to Ba Ria) you should fine. You can read more about the ‘back way’ here. Yes, that’s pretty much accurate about the weather. In January/February it will be perfect weather anywhere south of Nha Trang and it should also be OK in the Central Highlands too. But as you move further north the temperatures will get a lot cooler. Personally, I’d take my time in the south 🙂 However, quite a few readers have written to me saying they’ve had good (if cold) weather way up in the north of that time of year. Take a look at my guide to Weather in Vietnam. Yes, the central area around Hoi An and Hue is great, but so is the Ho Chi Minh Road is that area. However, because you have the time, you can easily do a loop in the centre that would take in the Ho Chi Minh Road and the Hai Van Pass which connects Hoi An/Danang and Hue. Read my guide the Hai Van Pass here and I will also be publishing a guide to this loop in the next couple of weeks, so stay tuned. Thanks a lot! I think I’ll try to spend most of my time in the south and central part and then do the north as fast as possible. Oh, and is there a way to charge your electronic devices on the camping? In general, you should try to be as discreet as possible when you are camping in the wild. Try not to be visible from any roads, and don’t be too conspicuous when you are setting up camp. This is not so much to do with safety, but more to do with not drawing attention to yourself. It’s best not to leave your tent for any significant period of time – it’s just not worth taking the risk. Of course, all of this doesn’t apply when you are camping at a designated area, such as the camp grounds on the Ocean Road. Also, remember that UXO (unexploded ordnance) is still an issue when camping off the beaten track: don’t just wander off into the jungle and don’t go digging any holes in the ground. I’ve written a bit more about camping in this post. The last two days from Kon Tum to Aluoi have been great days with heavy white clouds in the mountains between the two tunnels. Do you know of the exact location of the accommodation mentioned in the above posts at Thuong Son ( Long Son). The 250km is a little to long for my wife in one day. Therefore i need an alternative or I my have to skip this section. No, I’m afraid I don’t know the exact location – a reader posted it in the comments section a few months ago. I think they may have sent me an email with further details, but I can’t find it now. But don’t miss this section of road – it’s marvellous! Start very early in the morning, and remember that, even if you get stuck at night, you will find some one to put you up for a night: quite a few people have written to me having received similar hospitality on this section on road. I am currently doing a south to north trip. I started in HCMC and took the train to Mui ne. The coastal road along the Mui Dinh Promontory is under construction again the new road that they have built is covered with landslides they are blasting all the hanging rocks off the hill side now. The road at the time we went through last week was open but only to motorbike and bicycle as there was only small path opened by the locals. It looks as if they will be working on this road for a while still. But a beautiful section of road. Other than that all other ocean roads are all ok up to Nha trang. From Phan rang we drove up to Nha trang to Buon ho. In Buon Ho we found a new Nha Nghi called Thuy Tien just before the town. Very clean, very helpful staff and beds very hard($9).I have uploaded it to google. We have just completed day one of your ho chi minh road guide. If today is only the start I am so excited to see the rest. I will give further updates. Thank you all the effort you have put into these pages it has really helped. If there is anyone currently on this trip please let me know. Thanks for your update on roads and guest houses. It’s a pity about the Mui Dinh Road as that has only recently been opened! You have a great ride ahead of you on the Ho Chi Minh Road, however I’ll be interested to hear how the weather is! I hope you have a few days of sunshine and warmth. Glad you enjoyed your road trip. That’s a great loop. Nice video! I would be SO depressed if I ever saw dog being served anywhere. I’d love to go to Vietnam and take a trek like this, but the dog thing…I would be so disturbed. If you feel that way then it’s probably best not to go too far off the beaten track in Vietnam, especially in the north where dog meat is more popular. Stick to touristy areas because the government knows that many foreigners are sensitive about seeing dog meat for sale so it’s not so conspicuous in popular tourist spots. What an awesome article thank you so much! Me and my friend just bought some bikes yesterday and made our way up to cat ba. What an awfull road haha! Roadconstruction and tons of crazy trucks. Was a nice adventure anyway. As we’re just have a bit more than 3 weeks we propably will not make our way up to Muong Lay and Lai Chau 🙁 I would like to ask you if you have any recomendations from the way from Cat Ba (Halong) down to Phố Châu? As i’d love to do the hai van pass as well as the pass you described (wich seems INCREDIBLE) and hai on (for the tailors!) aswell as hue do you think thats possible? How long would id take you to do both? Any suggestions how we could do that? Do you have any expirience with selling bikes in cambodia? we were thinking taking them over there as we have some more time there and sell them in phon phen. From Cat Ba to Hai Phong and on to Pho Chau is not a straight forward journey. It’s easy to work your way through to Ninh Binh and then across to the Ho Chi Minh Road, but most of it is on main roads and fairly busy. You could try to thread some of the smaller backroads together – check your map – but as this is the Red River Delta it’s intensively farmed and populated, so any route you take will probably be quite busy. It’s not the most scenic part of Vietnam, so perhaps it’s best just to take the main roads and get it over and done with. Yes, you can do the Hue-Hai Van-Hoi-An-HCM loop but if you want to do it all you will have to double-back once. You can stay of the Ho Chi Minh Road to A Luoi and then continue on the HCM Road to Prao and Thanh My. (Or if you want to go to Hue first, just take the road east down to Hue from A Luoi). From Thanh My head east to Hoi An. Then from Hoi An take the Hai Van Pass up to Hue. How long it takes depends on how many days you want to spend in the cities – but the ride itself can be done in 2 days. Sorry, I don’t have any experience selling bikes in Cambodia, but I’m sure it’s possible. Really great site you put together and especially very informative when it comes to the motorbiking. It’s something I’m debating doing. This would be my first time on a bike and I am also traveling alone (female backpacker), thus the hesitation. This route seems great though: very scenic and paved roads. Currently I am in Saigon but I want to work my way up to Hanoi next week. I was thinking of doing the coastal route going north by bus then come December, working my way back down again via the Ho Chi Minh Road on a bike. Any thoughts on going North to South vs South to North? I also figured maybe along the way I might meet some people who would want to do this with me (if anyone reading this is interested please reach out! I’m also open to going South to North but would want to leave next week :)) I also have some questions about purchasing a bike, if you could please reach out via email that would be great. Thanks Tom! I think travelling on your own as a female in Vietnam should not be an issue. Vietnam is still generally a very safe country in which to travel. Just take all the normal precautions you would in any other country. I would recommend travelling north to south at that time of year because, in December, the weather in the north and central regions will be turning a little chilly. Hi again Tom:-) I’m spending 3 weeks motorbiking in Vietnam in January/February 2016, and my brother will join me for 8 days, so wondering which 5 days worth portion of this trip you would recommend that we could do together (I want to keep 3-4 days for him to visit Hoi An and Hanoi, short I know…). Obviously we also need to get there, and not sure if makes a difference if approached South to North or North to South (I can fly in & out of either Hanoi or Danang). Many continuing thanks for this amazing blog, and for your contagious enthusiasm! So are you looking for a good ride around that area (Central Vietnam) or anywhere? Amazing guide we are just about to start this adventure from hcm. You could take the HCM Road all the way from Saigon to Kon Tum (where my guide begins), but I would recommend taking the ocean roads up to Quang Ngai and then heading west up to Kon Tum on Highway 24, because this is more scenic. Just make sure you stay on the new ocean roads and back roads as much as possible, thus avoiding Highway 1: follow this guide up to Nha Trang, then look closely at this map for the smaller roads between Nha Trang and Quang Ngai (at some points, as you’ll see on the map, you will have to take Highway 1). Of course, it also depends how much time you have. 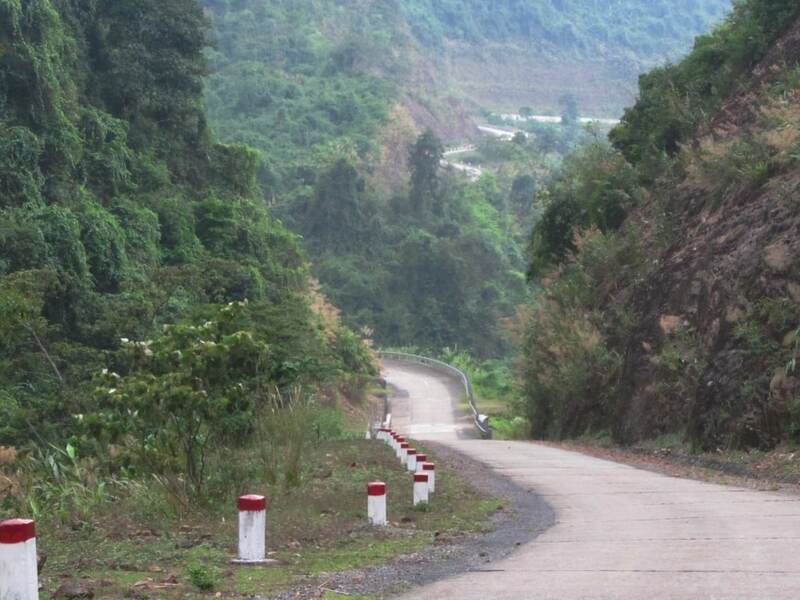 If you want to get to Kon Tum as fast as possible then take the HCM Road or Highway 1 all the way, but you would be missing out on some great coast roads. You can also browse all my coastal routes here. You can use any bike for this route as it’s all on paved roads. A fully automatic Yamaha Nouvo or Honda equivalent is good, or a semi automatic: both are good, reliable machines. Thanks. Looks like you had a great experience. Nice video! Hey Tom thanks for this. I’m leaving in the morning on my trip from Hanoi to HCM. Drving Highway 1 does not sound like so much fun. I would definitely avoid Highway 1 as much as possible. Don’t worry about break downs – in Vietnam you are never far away from someone who can fix a bike, even if that means knocking on someone’s door in the middle of nowhere. Just remember this word: sửa xe – it means bike repair. Hey again, figured id report back regarding the condition of the road I mentioned previously. It’s all good! It’s looks pretty newly completed and was smooth the whole way (aside from going through a couple of towns). Hey Tom! Really liking your site. Full of some really great information and has been super handy on our trip so far. Just wondering if you have an experince on the Ho Chi Minh road south of Kon Tum to Saigon? I really enjoy the inland roads and mountains. I saw the route on your map cuts out to the ocean after that. Is that because its a nicer ride along the ocean roads? The Ho Chi Minh Road south of Kon Tum is nowhere near as scenic as the central and northern sections – it follows two relatively boring plateaus. Plus, road works on that section have kept most riders away for at least the last year. However, it’s been a while since I’ve ridden that particular section, so perhaps it’s worth a go. If you’re in Kon Tum now then it’s worth asking at your hotel or something to see what local people think. Highway 24 from Kon Tum to Quang Ngai is great. Then you have to stay on Highway 1 for about an hour and a half before turning off at Tam Quan for lovely coastal back-roads to Quy Nhon and beyond. If you haven’t already, then zoom in on the relevant areas on this route map. Click the yellow stars for links to my guides to the coastal back-roads, particularly south of Nha Trang. Or if you want to head back up into the mountains, the road from Nha Trang to Dalat is good. Thanks a lot Tom for a great source of information. A friend and I travelled by bicycle from Hoi An to Phong Nha via the HCM west road. A fantastic trip. As you mentioned, there was very little north of Khe Sanh. We were close to deciding to head back to the coast for the last 250km. However! We got a tip-off from a tour guide about a place to stay in Thuong Son (marked as Long Son if you zoom in enough on google maps), about 135km north of Khe Sanh. Sure enough, a rudimentary hostel was there, in the beautiful village. It was pretty clean. The owners seemed surprised to see us. And the building was distinctly empty. There was no food in the hostel itself but a few places to get rice and pho in the village. We were charged 300,000 VND for the room. The best food was turning left out of the hostel, and left again at a sign for food up a track to a house with a large terrace. For other cyclists’ sake, we didn’t end up going by the HCM west all the way from Thong Son to Phong Nha since we predicted no opportunity for food or drink north west of Rinh Rinh (fork in road and river 25km north of Phong Nha). We turned right at this split and joined the HCM east instead, then retraced the HCM west from Phong Nha as far as we dared. All hugely recommended, especially the 135km north from Khe Sanh to Thong Son! Glad you enjoyed your bike trip so much. Just a question re the day 4 part of this trip, Im so keen to do this but just concerned if anything happens to my bike as Im travelling alone, I assume there is no chance of finding mechanics on this road?! There are people and houses here and there. And because it’s so remote, most households double as mechanics/gas stations, so if you get into real trouble just ask the first person you come across and chances are they’ll be able to sort it out. I hope you enjoy this fantastic route. Thank you for this post. My girlfriend, good friend and I used your guide to take the HCMH West from Hoi An to Hanoi mid April. I’ve been traveling for the last 2+ years and the week on the bike to Hanoi was probably the highlight of my whole trip. I’m still in awe of the roads, the mountains, the karsts, the people and the adventure. Thanks again for bringing this ride to my attention. We still have the bikes in Laos and hope to sell them soon in Ving Vieng or Vientiane. The roads and views rival that part of Vietnam, but it’s much harder and more expensive to fix the bikes and get parts. Still a great time though. Thanks. I’m happy to hear motorbiking in Vietnam was a highlight of your massive global adventure! Yes, I’ve heard only good things about Laos for motorbiking. I was there in 2004 so it must have changed a lot since then. I’m sure you’ve already heard of the Midnight Mapper, but if not Google him immediately – the whole of Laos mapped for motorbikers! Yr right – it is touro madness with mediocre foods. But get up early and grab some Banh Mi rolls being made in the street. Also bought cooked corn and pineapples from local market and that set us up for the ride to Khe Sanh. 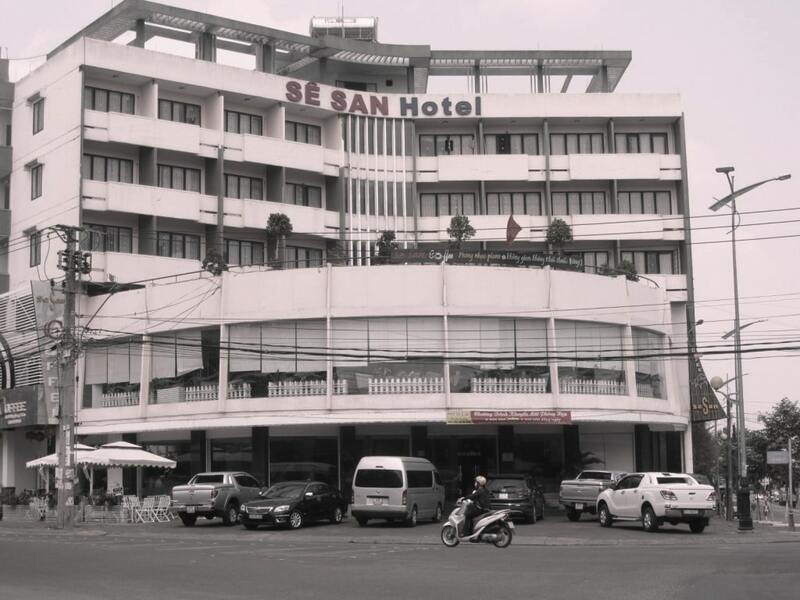 We stayed at new hotel Kach San Thanh Phat across the road from Easy Tiger. This is a great 21k section of road that spits you out at a 4 way junction. it’s well signed turn left to Khe Sanh 223kms & yr on yr way. Yep you were right there! We saw no one and nothing for at least 100kms. It’s very peaceful. The Thanh Quang was definitely a brilliant guest house – the lady who runs it made us very welcome and our bikes secure at night. The ride on this section was SENSATIONAL. The only thing on the road was cow poo. Eat lunch in Prao – there’s a family noodle place on rhs as you ride through, their soup and noodles were great and that made a good coffee. The ride from Prao to Thanh My – get ready, it’s 50kms of pure cornering clinic! Vietnamese road engineers Australia needs you! Road conditions are so good but take it easy last few ks into Thanh My. There are guest houses in Thanh My, we stayed at a brand new one on the left as you ride into town. Like Tom says, embrace the guest house, they’re great! They looked after us heaps better than hotels. Works great from English to Vietnamese but Vietnamese people told me its a shocker the other way around. For 2700ks across Vietnam it helped us a lot though, installing the Vietnamese keyboard on my phone was incredibly helpful. Happy to hear you enjoyed the road trip. It certainly is one of the best rides in Vietnam. Thanks for the feedback and other tips. Thank you for this, very well writen en perfect guidance. ps towards Phong Nha you’ll find people selling fuel from the barrel. Thanks. I’m glad you enjoyed the trip. And thanks for sharing the valuable information about the fuel too. Just wanted to thank you for your amazing blog! Just plowed my way through highway 17 from Ea Drang to Pleiku. Mostly under construction right now, but that makes you appreciate the good bits even more! Thanks to your extensive coverage of the ho chi min road. I can’t wait to experience this delight from Kon Tum onwards! Your blog is brilliant! My boyfriend and I are not only your followers online but also on the road! We are planning on riding on to Da Lat. Can you recommend a route through the backroads? Good to hear you’ve been having a fun road trip so far. Yes, the the section of the Ho Chi Minh Road from Kon Tum south is being upgraded. So it might be best to cut down to the coast and then head back up to Dalat from Nha Trang. From Kon Tum there’s a wonderful road down to the coast near Quang Ngai: Road 24. From here you’ll have to join highway 1 for a couple of hours before getting onto a superb coastal back-road at Tam Quan all the way to Quy Nhon. From Quy Nhon take the coastal branch of Highway 1 (very scenic) to Chi Thanh. Here turn east towards the ocean and work your way on back-roads all the way to Vung Ro bay (south of Tuy Hoa). Here you rejoin Highway 1 for the last 100km to Nha Trang. Then take the mountain road direct from Nha Trang to Dalat. Zoom in on this map to see the coastal back-roads mentioned above. Pingback: Easy Rider | Reis up! thank you for the post! It helped a lot to see different Vietnam. We have enjoyed HCM road a lot. And you tips about Homestay was extremely good. We loved it. The only thing we didn’t like so much – it was the rain.. It rained a lot, and clouds hidden the best parts of mountains. Hey man, your guide sounds really awesome. I’m attempting to start my first solo 2 wheeled trip relying based on your really comprehensive and informative guide. I have many questions to ask, so yeah, firstly, may I know how do you reach Kon Tum? Do you take a plane to Ho Chi Minh City and then take a bus to Kon Tum? Also, how do you exit the country from the last checkpoint, Pho Chau? Do you take a bus to Hanoi and exit from the Airport at Hanoi, since its nearer? Thanks for your comment. I have replied to you by email. Check your inbox. A quick question: I am going south on the HCMC which road do you suggest from Kon Tum to Nha Trang? You can take Highway 19 or 26. Highway 19 goes to Quy Nhon on the coast and from there you can take the coastal back-roads and Highway 1 to Nha Trang: this is a good choice if you have at least a couple of days to ride from Kon Tum to Nha Trang. (For the best coastal route from Quy Nhon to Nha Trang zoom in on the relevant section of this map). Highway 26 is the most direct route – you could ride it in one day if you wanted to. Too old to drive a motor bike (never driven one either). Any other means to take tis wonderful trip? Please sed copy or reply to email address also. Yes, you could do it by car. Either rent a car in Hoi/Danang or hire a driver. Is there anyone will hire a car? Using google I couldn’t find anyone. Yes, you can hire a car and driver from most hotels in large towns on the Ho Chi Minh Road – such as Khe Sanh, Kon Tum, Xuan Son (Phong Nha) etc. Have you ever made a trip out to the border of Vietnam, Laos and Cambodia? I recommend it especially its only 30 minutes West of Plei Can (Where you head north near Kon Tum). Definitely the most scenic part of anything I’ve done in Vietnam. although I have yet to motorbike the north part of Vietnam. Google maps won’t show all routes that can be taken once you hit dirt roads. You will have to use Bing maps for more details. There is one route that is completely paved however, it lacks most off the scenery until you get to the top. Most of the other routes will be dirt and on the ridge line of the mountains as you bypass locals carrying sugarcane across the borders to make some extra money. Be warned you most likely will encounter few people. Even less than the HCM Road West. Yes, I actually ended up in that area last year by mistake. However, after an hour I realized I was on the wrong road and turned back around again. I’ll try the paved section next time I get the chance. I tend to stay off dirt roads because my bike is not well-suited to mud! I have the same exact bike as you, if you are still rocking the Nuovo 3 that is. You should be fine! Yes, still the Nouvo. I’ve had it for 8 years. It’s great. Firstly, great site, well put together, informative and well written. After attempting India solo on 2 wheels I gave it up as a bad idea. Here the roads look great though. I became super excited to ride, so much so I searched for a bike in the old quarter here in Hanoi, as suggested by my hotel front of house staff. A rather dodgy looking $300 bike and a around 3 weeks to head south to HCM, using your map. It’s been serviced, I rode it all day to appease my mind before I leave, with one more day to buy a few supplies and plan the route. My question here is, do you recommend the ride between Hanoi and the start point on your map? Home stays are my first choice. Guest houses and if necessary, hotels. Do you perhaps have a list of recommend places with contacts I could reach from prior booking and availability? It would be a big help. Lastly, any essentials you recommend to take along? I definitely recommend the route on my map – I think it’s the best possible motorbike route between the two cities in terms of scenery and avoiding traffic and main roads. There are guest houses all along the route in towns and villages – just look for signs saying ‘nhà nghỉ’. Homestays are more difficult to find. You don’t need to make reservations for the guest houses – just try to find one at the end of each day. Essentials – well, make sure you bring a good rain coat! A full rain suit (coat and pants) is best as it’ll keep you completely dry even when driving through storms. Also bring plenty of big plastic bin bags to put your luggage in during any rain. Between October and January will still be OK. In October you’ll probably still get some rain and towards January the temperatures in the mountains can get quite cold. Do you mean 10 days to get a motorbike licence? The majority of travellers don’t get a licence when they drive a motorbike in Vietnam, they just rent a bike and go. Another question?-does it really take 10 days to get a licence?We would be coming from Goa india,hoping to have just a short stay. Can you not apply in advance? We would like to do this trip but could only make it during Oct to late Jan. would the weather be suitable? Thank you so much for this guide, I would never have done this trip without this website. I never would have even known about it. I am writing this from Khe Sanh right now. I just wanted to let you know I found a new hotel that must have been built recently bc it super modern w/ flat screen TVA in every room and only $10 per night. Much better than that “miserable” hotel you recommended for $15 I’m sure. The name is Khanh Phuong Hotel if you want to edit your guide. Great, thanks Mike. I’ll definitely give that hotel a try next time I’m in Khe Sanh. I hope you enjoy the next bit of the ride on the Ho Chi Minh Road – it’s one of my favourite parts of Vietnam.